This was to be the best day of the Easter weekend, apparently. 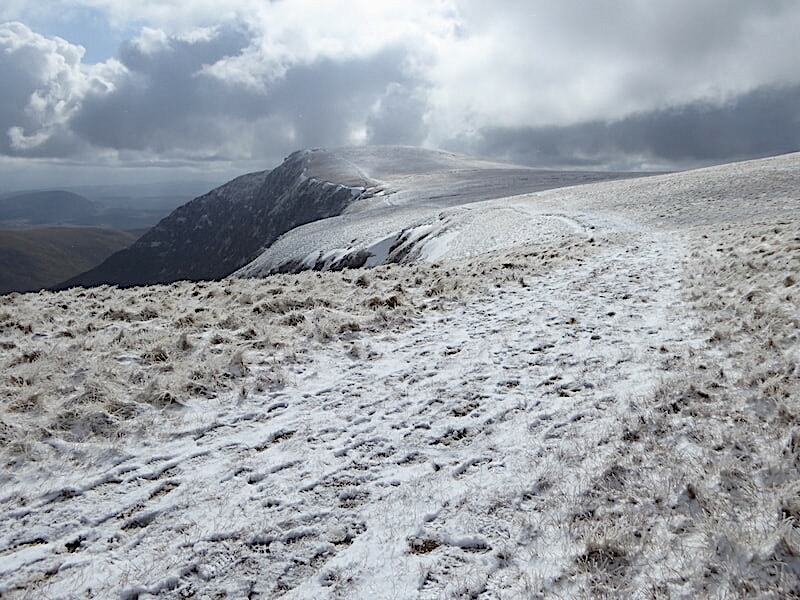 So, as yesterday was cold and dull and tomorrow we are in for more rain, sleet and possibly snow, we thought we’d better get out walking somewhere today while the going was good. 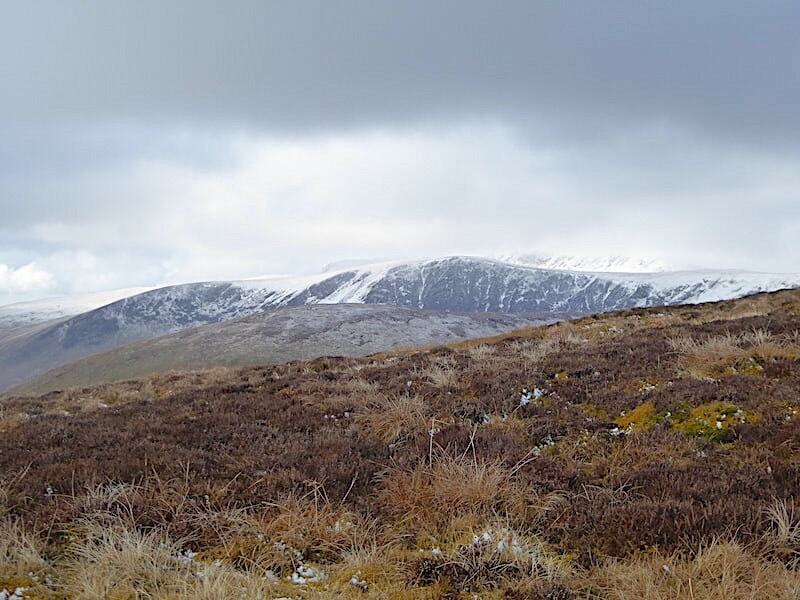 Nowhere looked particularly inviting, with heavy cloud and a north-easterly wind everywhere, so we decided to stay fairly close to home and just have a walk over Bowscale Fell and Bannerdale Crags. A disappointing day in terms of views though and the clammy, dampness of the air around us had all the appeal of a wet grey blanket. The calendar says its spring but the weather has yet to take notice. 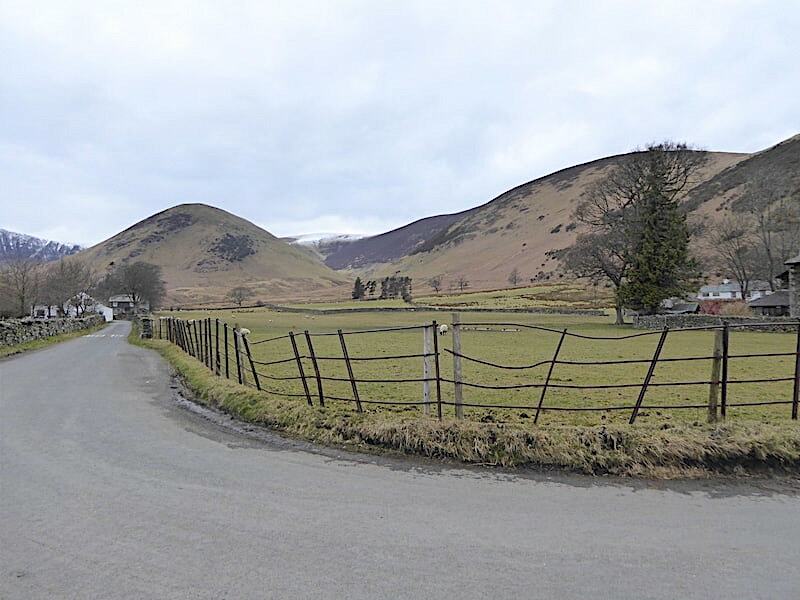 There’s a small area of roadside parking at Mungrisedale close by the turn off for Hutton Roof. Nobody parked there when we arrived so for once we didn’t have to park in a space that nobody else wanted. The sort of space I’m referring to is one which usually has a huge puddle next to it and is surrounded by inches of churned up mud just waiting for you to step into. No such problems today though, it was frosty again last night so the ground was dry and hard. 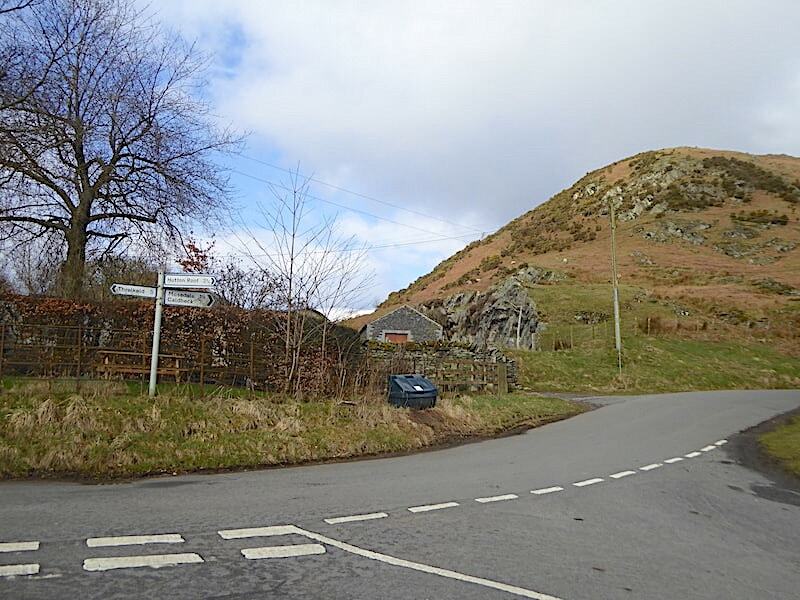 The start of the walk is a few paces up the road where a little lane turns off to the left, just beyond the salt bin. 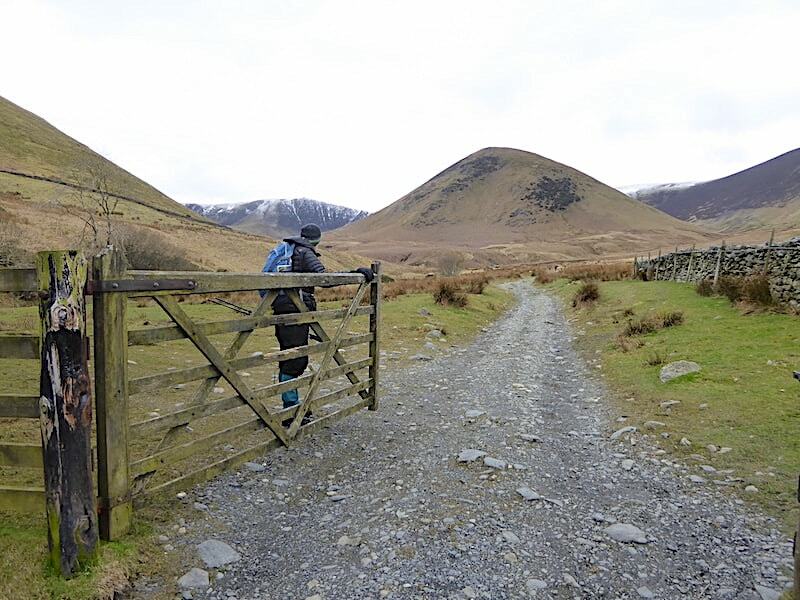 A short distance along the lane we pass through a rickety old gate and almost immediately turn right …..
….. onto the path up Raven Crags. It doesn’t look much but it is very steep and, as if to add insult to injury, it winds its way through overhanging and very prickly gorse bushes. By way of compensation though it does veer over to the left and so avoids the need for any scrambling over the craggy bits. 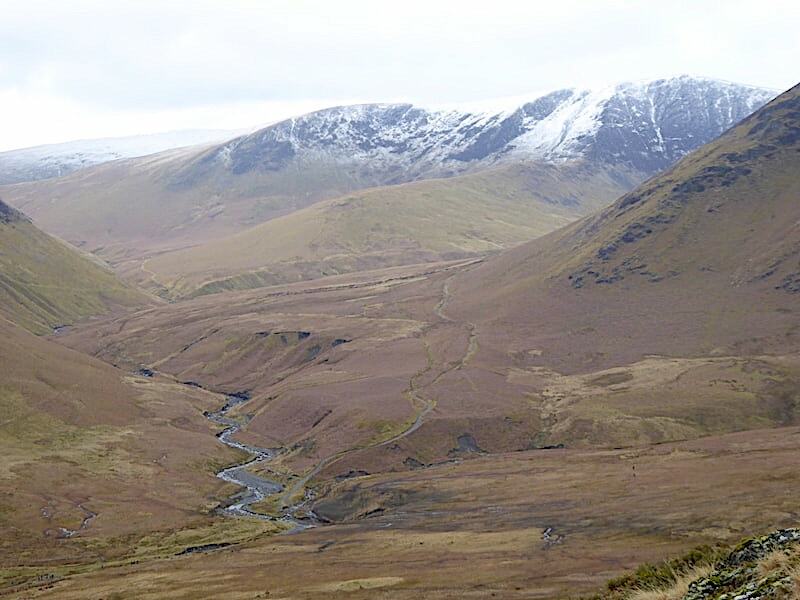 Its not a very long climb but it is a lung-buster so on one of our stops I took the opportunity for a shot along the Glenderamackin valley framed by Souther Fell on the left and The Tongue on the right with the snow capped Bannerdale Crags across the middle. 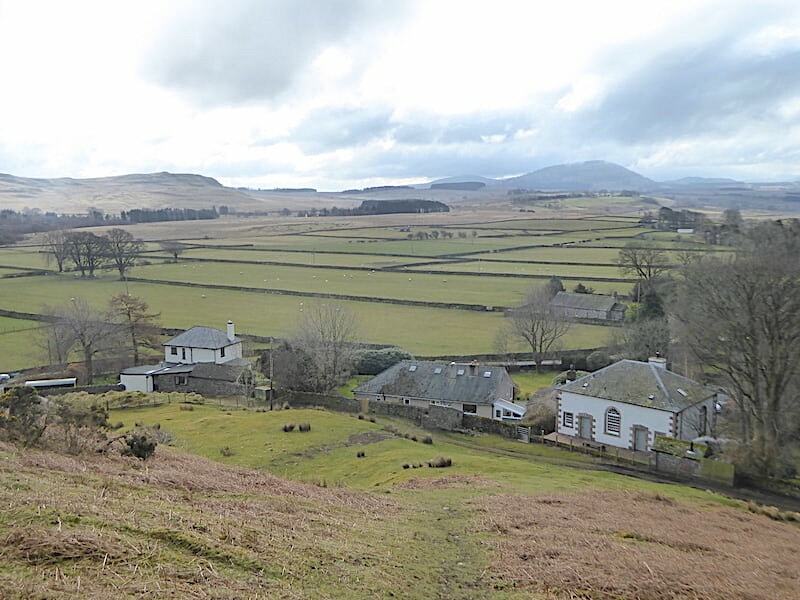 Below us is part of the little hamlet of Mungrisedale and beyond the fields is the smoky grey hump of Great Mell Fell. 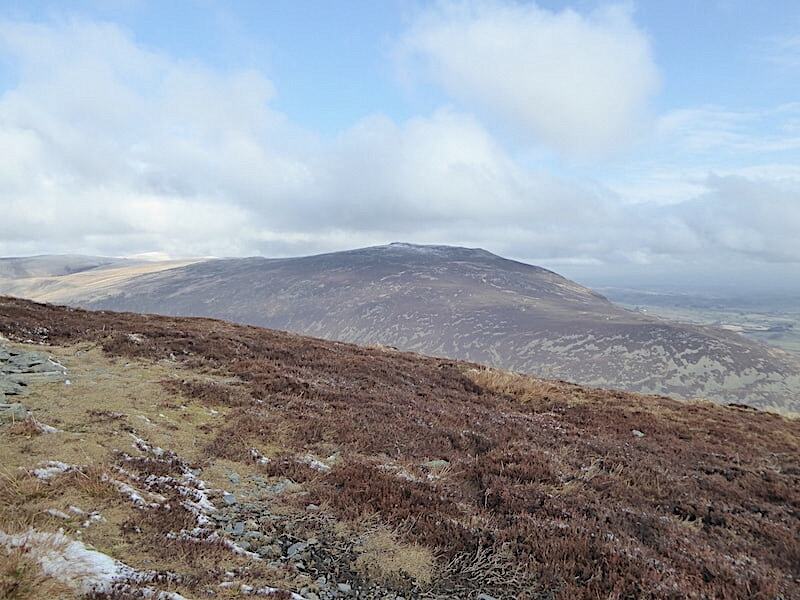 Souther Fell from a slightly different aspect as we continue gasping our way up Raven Crags. 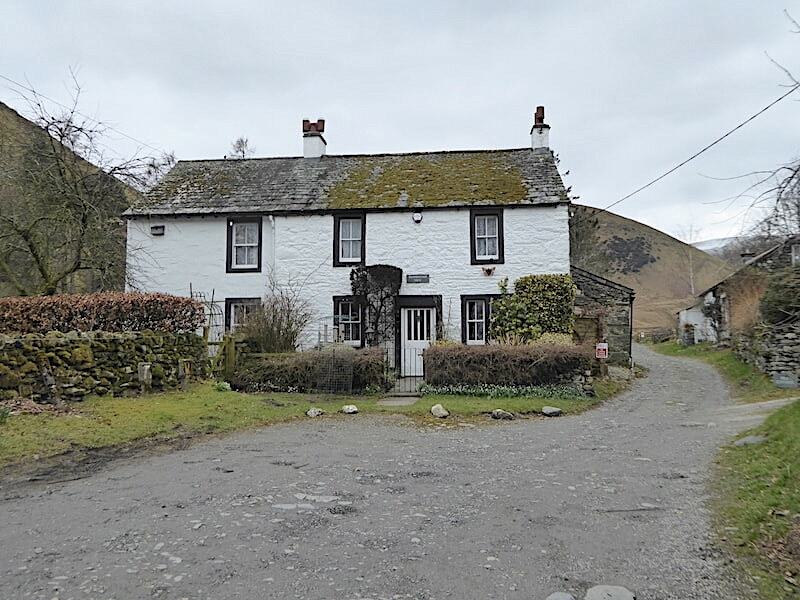 We’ve only been walking for a few minutes and already we have gained quite a lot of height, with the houses of Mungrisedale now looking very tiny. 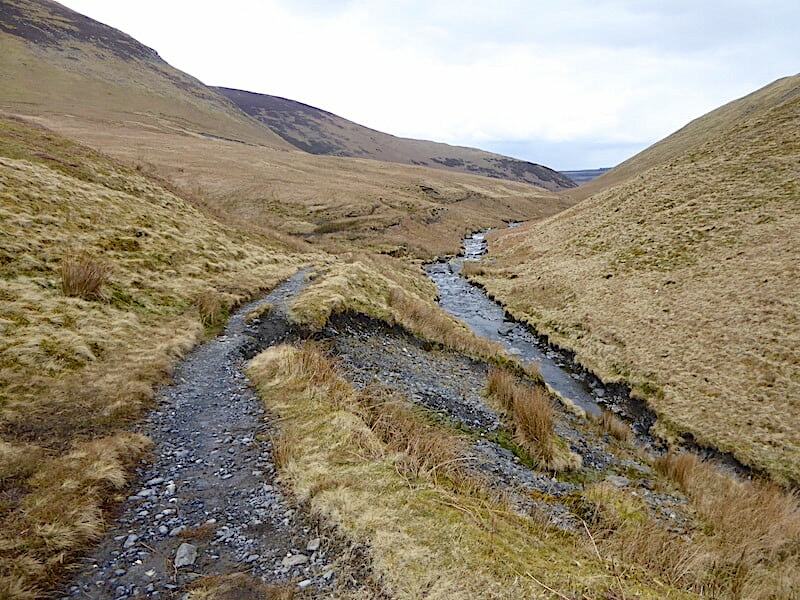 A closer look along the Glenderamackin valley and the river snaking its way along it. 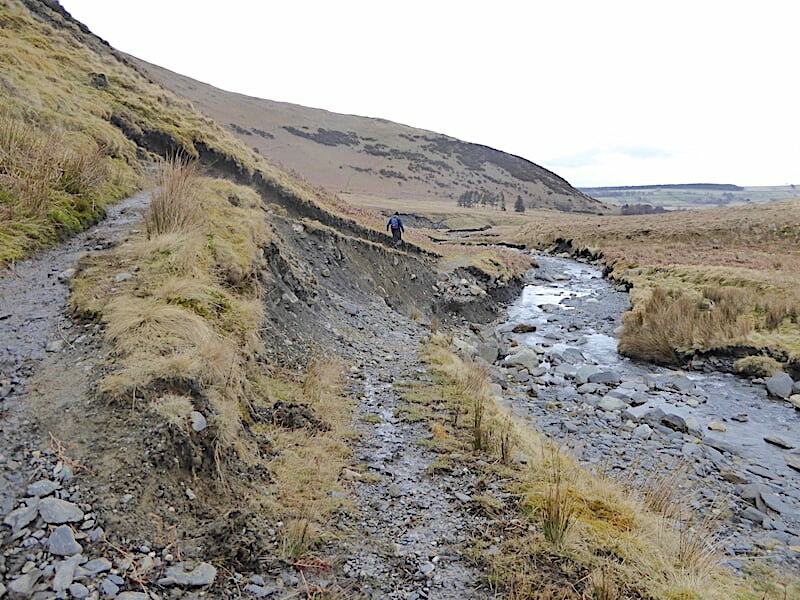 The path dropping down to it from The Tongue comes to a very abrupt end thanks to Storm Desmond in 2015. The swollen river cut into the banks and washed away large sections including the footpath. We shall be returning along the valley path, which we haven’t walked along since the storm, so we’ll be able to have a closer look at the damage then. 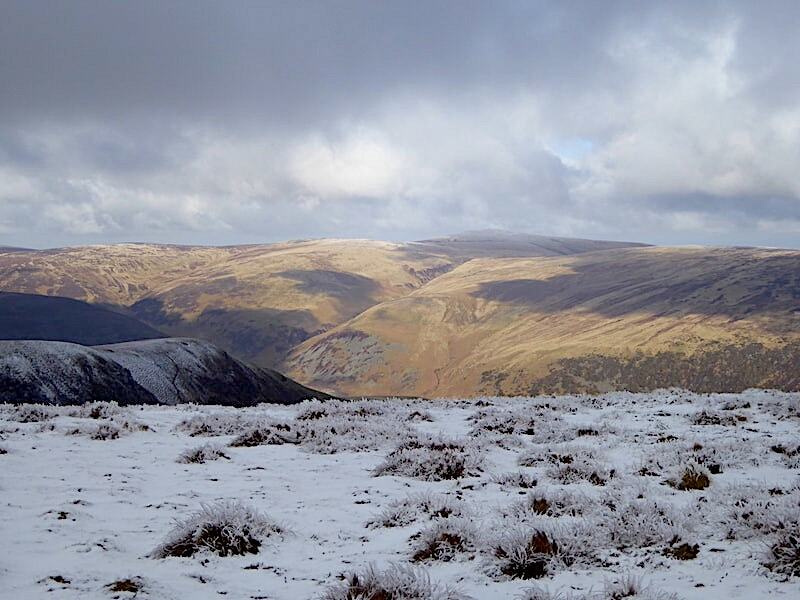 We reach the crest of Raven Crag where the gradient eases dramatically. 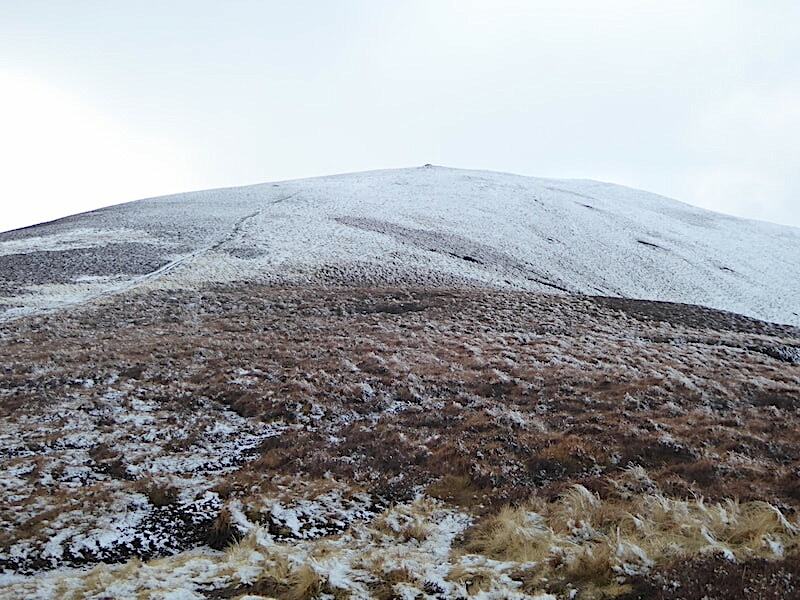 That’s not to say the climbing is over and done with because it isn’t, but when compared with the initial steep slopes of Raven Crags it becomes a great deal less torturous and breathing becomes much less laboured. 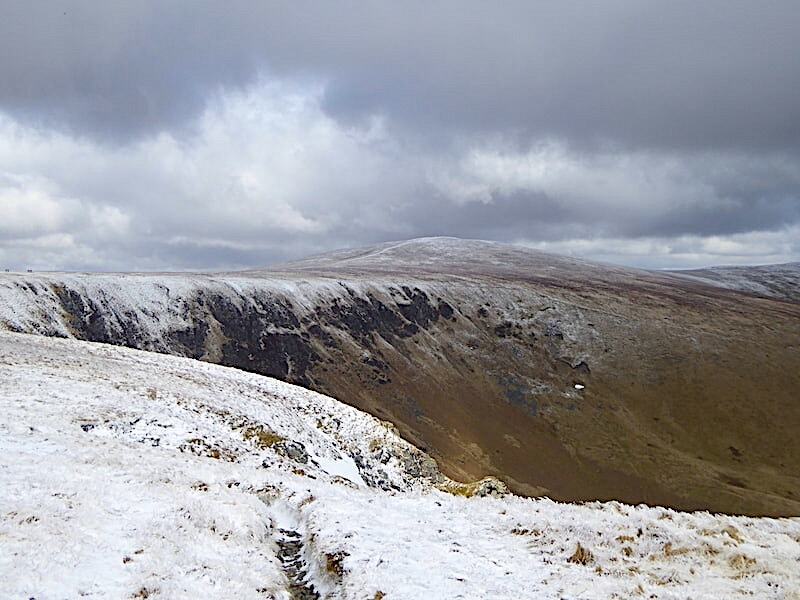 Blue skies above Carrock Fell to our right as we continue on across the east ridge of Bowscale Fell …..
….. but under heavy grey cloud over to our left Bannerdale Crags rise up beyond The Tongue. 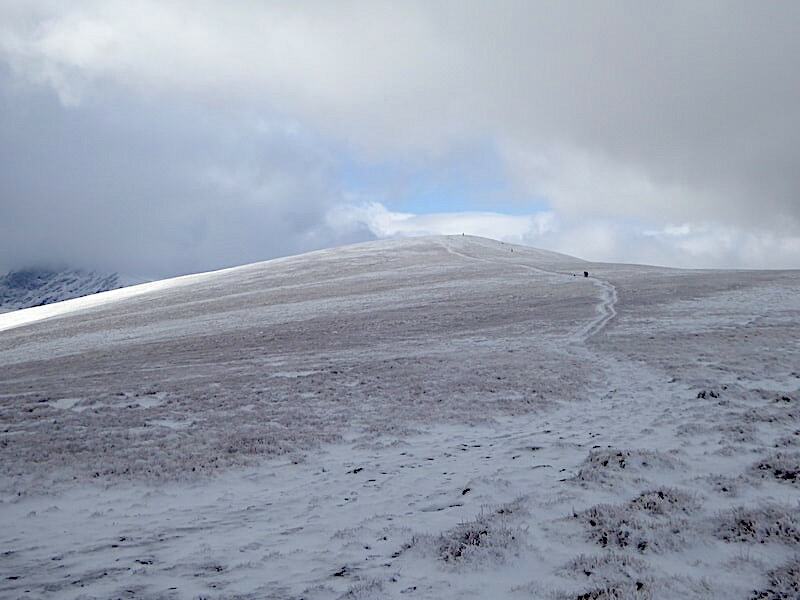 This is one of those paths which just seem never-ending but there is nothing difficult about it, its just a long steadily rising slog up to the first false summit, at 1981′ (604m) which is the high point to the left of the skyline. 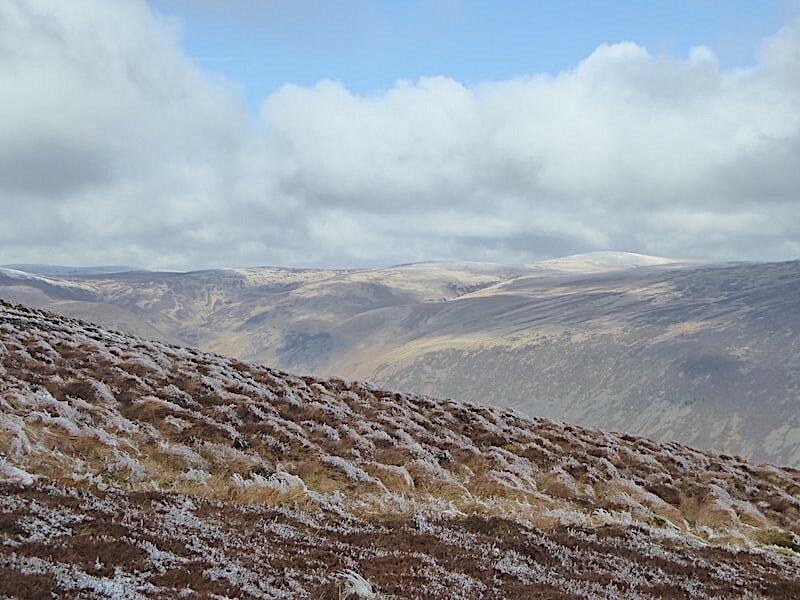 The heather covered slopes of Carrock Fell keep us company for much of the way …..
….. and beyond it the snowy top of High Pike which, together with its neighbours, seems to be getting all the sunshine that’s on offer over here today. 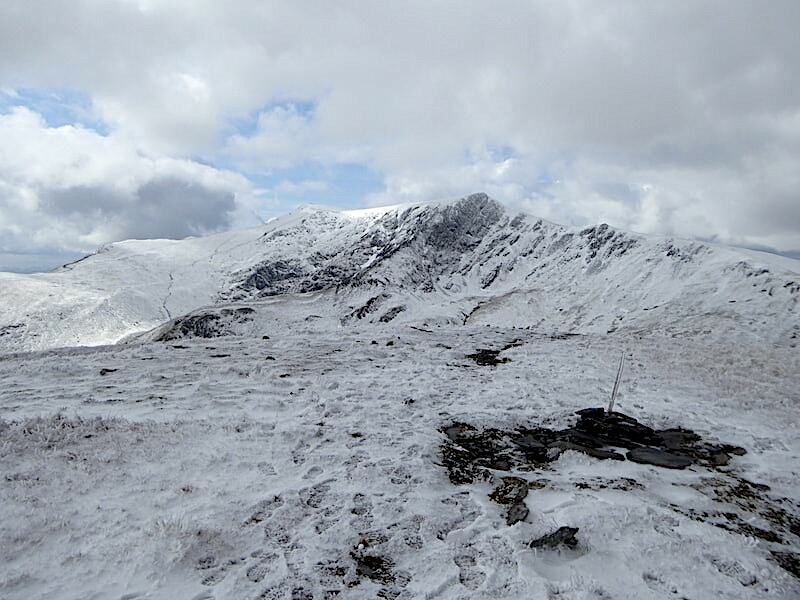 We could do with some of that over here but …..
….. we’re still cloud covered as we reach the snow line at the first false summit and take a look ahead to the even snowier second one. From here the path levels out for a while before it begins to rise once more. The occasional patches of bog were fairly sound after last night’s frost so no wet boots so far. 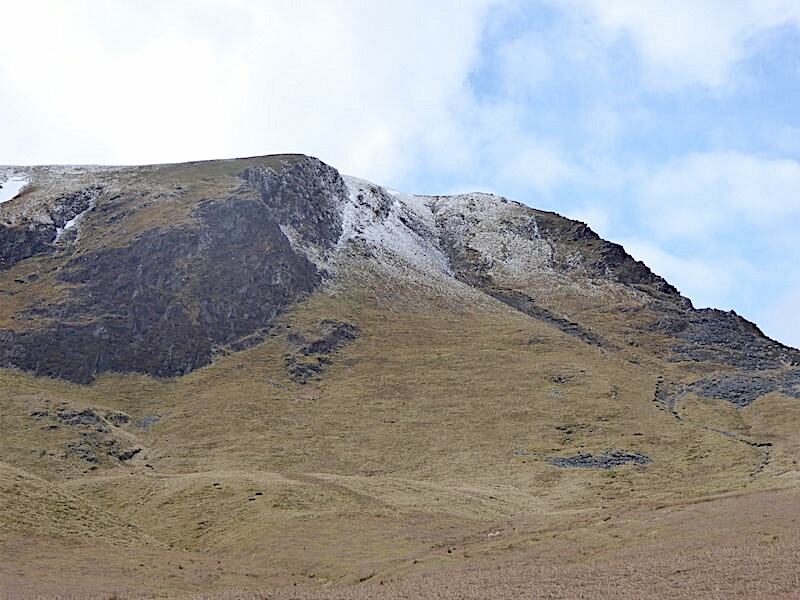 A brief spell of sunshine on Bannerdale Crags and to their right, behind the crags is Blencathra, the summit of which is cloaked in thick cloud. 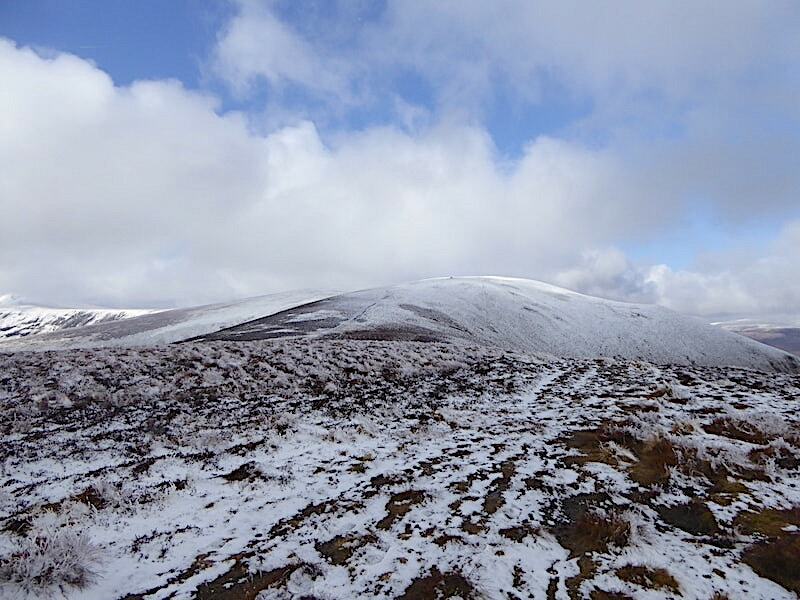 On we go, making our way across the next patch of rising ground up to the cairned top at 2185′ (666m). 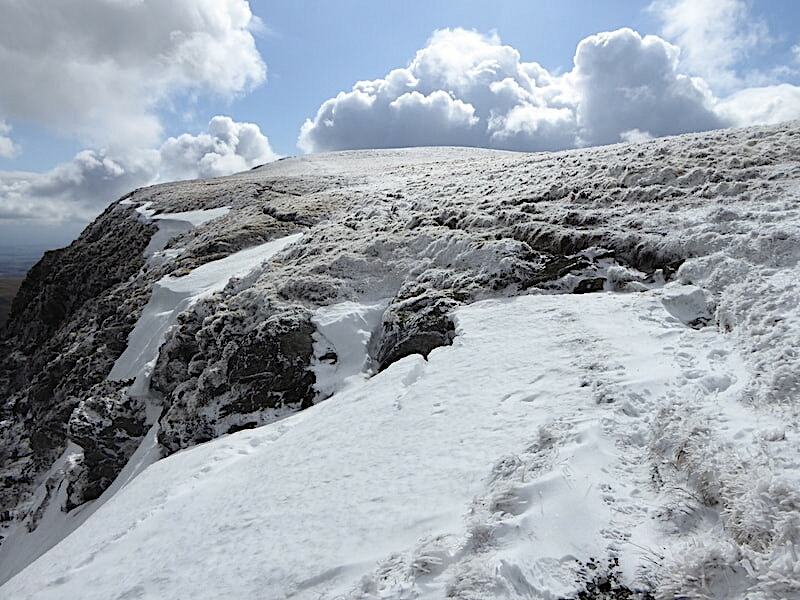 The path is wide and clear to see so navigation isn’t a problem today. 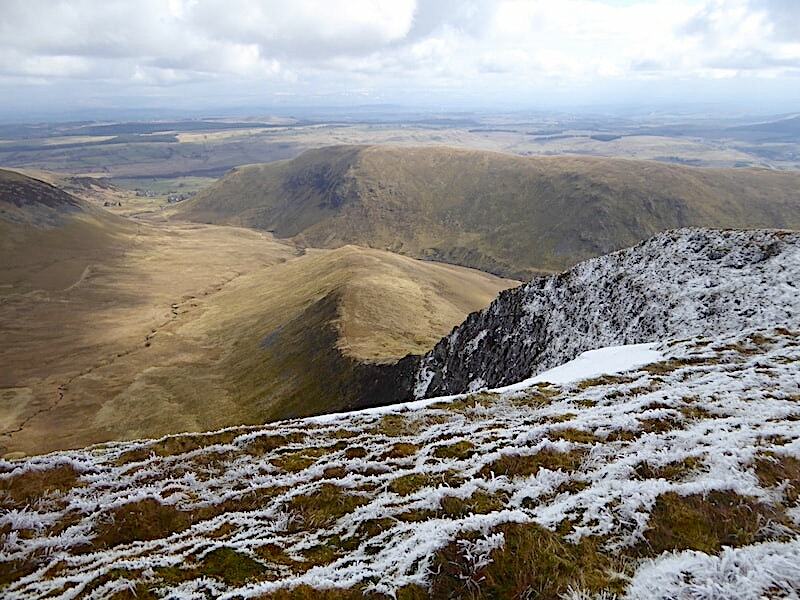 A glance across Bannerdale Crags to where Blencathra is still cloud covered but with a hint of sunlight on its corrie slopes below the summit. 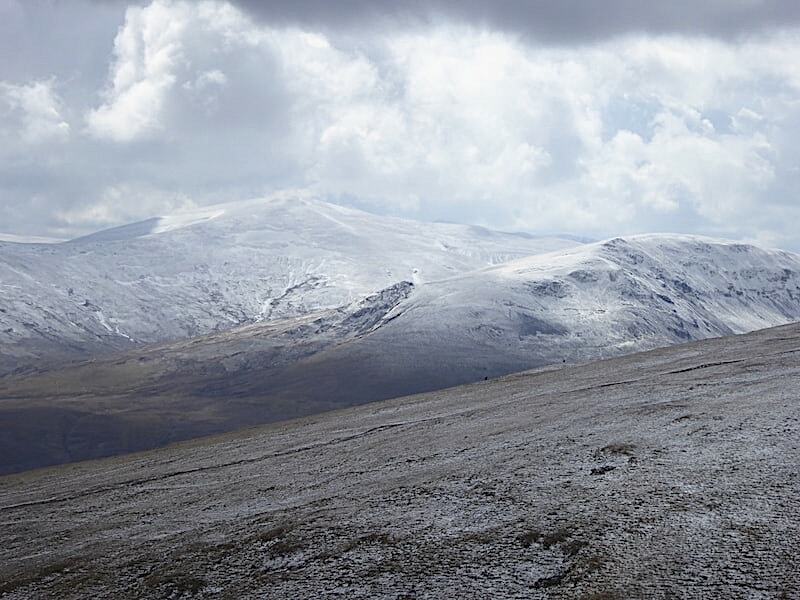 A sombre but atmospheric view looking back to the first false summit from the second one, and over on the middle right a few weak rays of sunlight just about manage to illuminate a patch of Threlkeld Common. 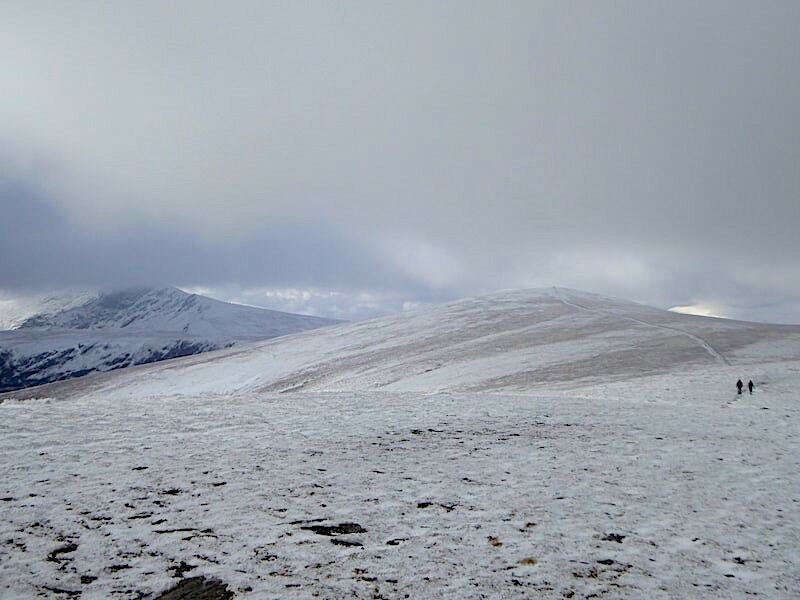 Bowscale Fell’s summit eventually comes into view and the cloud has lifted slightly over Blencathra. The couple just ahead came by us as I was taking the photo of Bannerdale Crags, four photos back, and were walking at some pace so how the heck have we managed to catch up with them walking at a much steadier pace than theirs? They must have had a short stop here for a bit of a breather and to add jackets as by now the north easterly wind was becoming quite nippy. 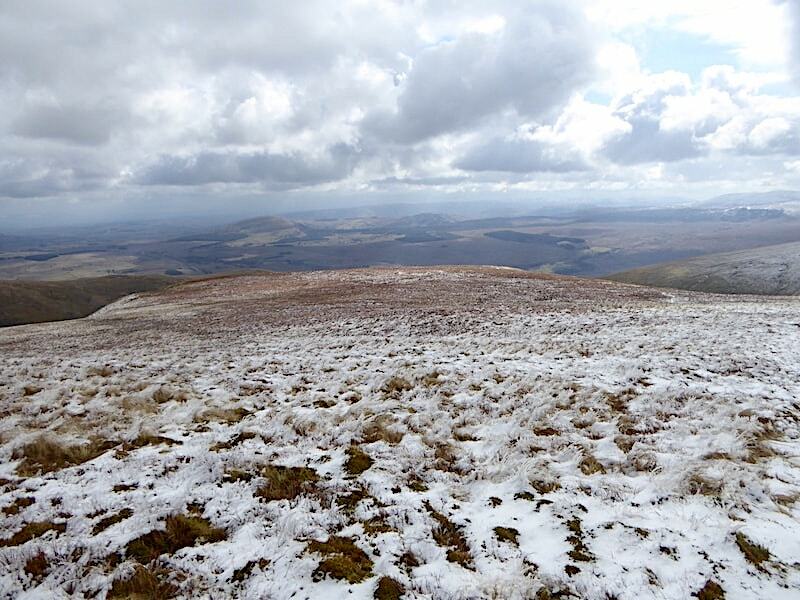 Another view towards High Pike and the Caldbeck fells which are still getting all the sun. 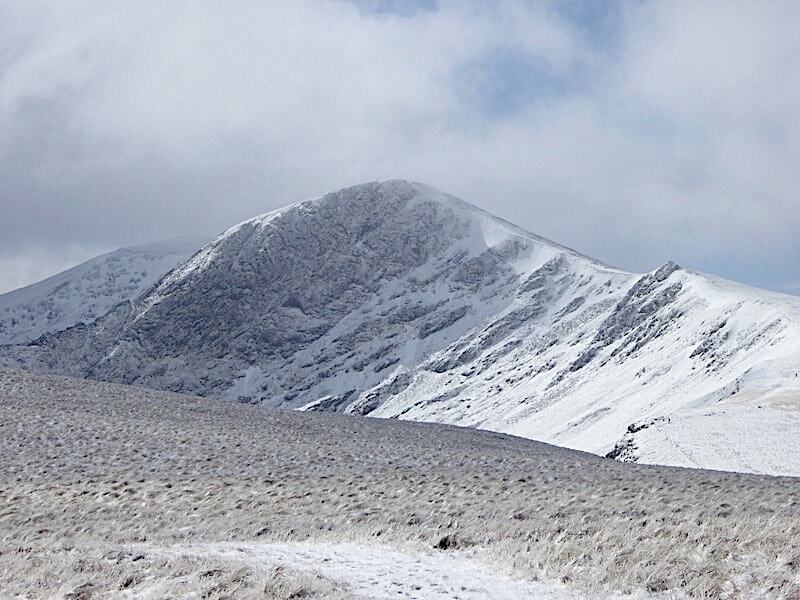 A feature we’ve noticed happening on previous walks up here so we seem to have chosen the wrong fells today. Having said that you could probably lay a safe bet on what will happen when we do get round to walking over there again! 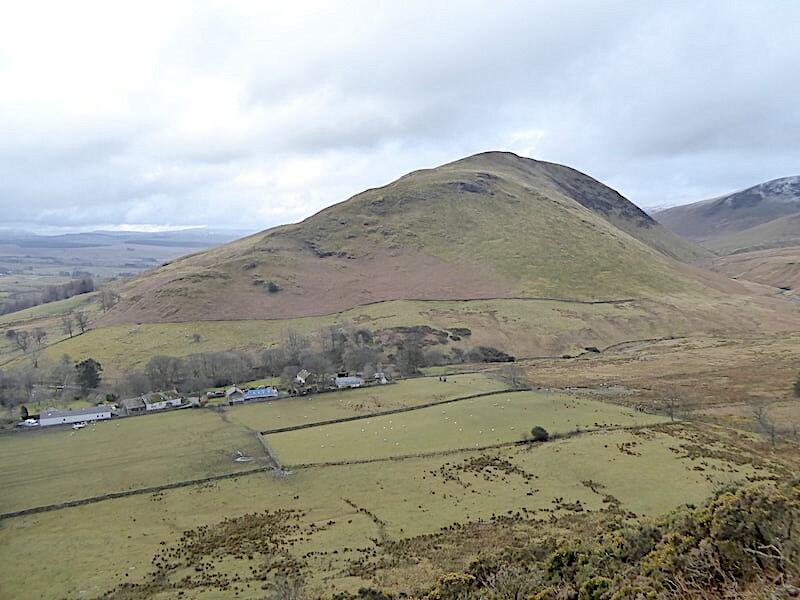 Moving the camera a little further to my left for this view, across the north ridge of Bowscale Fell to Coomb Height, the dark mound just behind it. 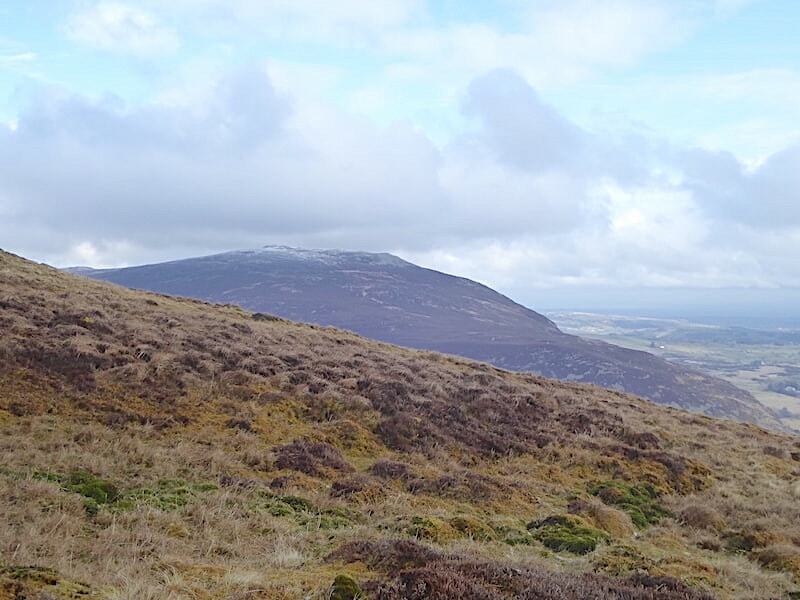 Beyond Coomb Height on the left are Knott and Great Sca Fell. I didn’t think it worth bothering to walk down a little way for a view of Bowscale Tarn, it faces north so it wouldn’t be sunlit even if it was sunny. 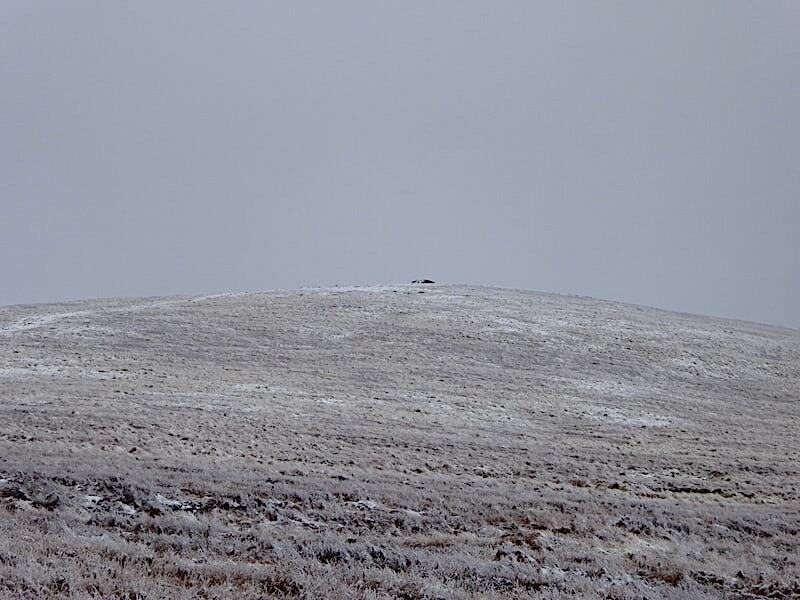 Meanwhile the power walkers up ahead are driving for the summit like there’s no tomorrow joining other walkers who have arrived via the north ridge route from Bowscale hamlet. 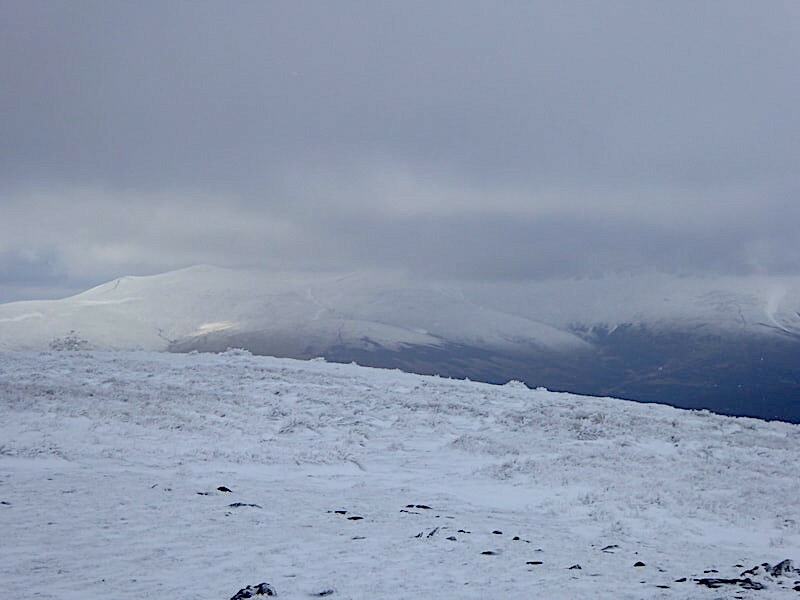 From the cairn at not quite the summit the view across to the Skiddaw group, snow clad and cloud covered just like Blencathra. 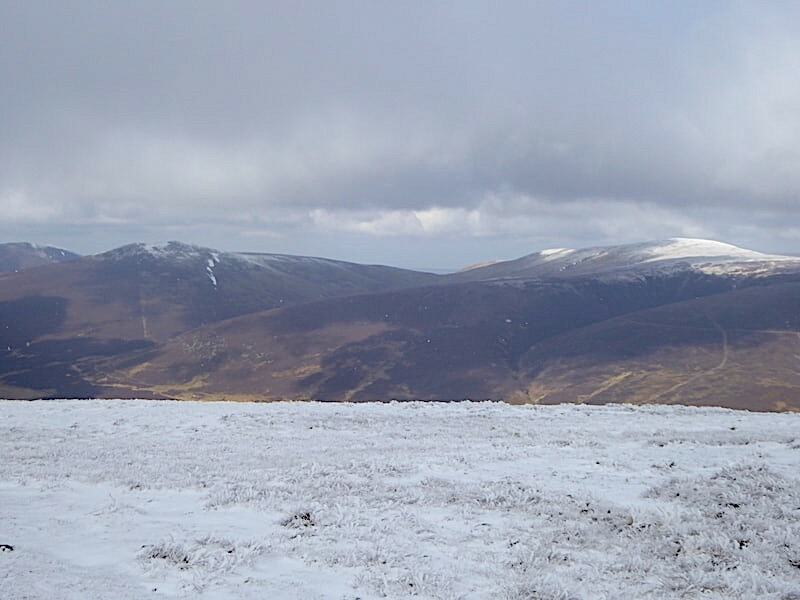 My thoughts went right back to my solo walk up here on 25th March 2017. Some snow was still lying around but it was a beautifully sunny and calm day. I climbed up out of Bullfell Beck sweating buckets, and down to just a t-shirt with my trouser legs rolled up. Just a year between them yet the two days couldn’t be more different. 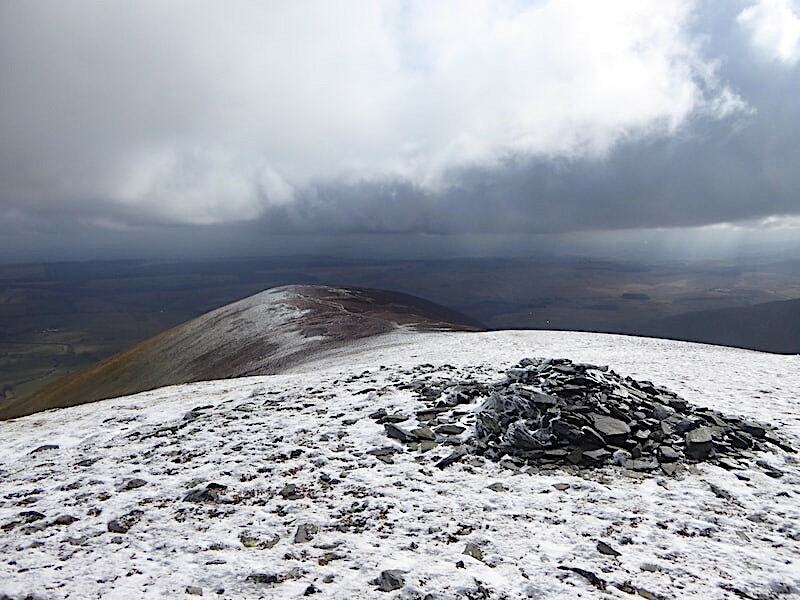 From the cairn we stroll the last few yards over to the summit shelter which, to be honest, unless you lie flat on the ground beside it provides little protection, if any, from the wind coming across from any direction. 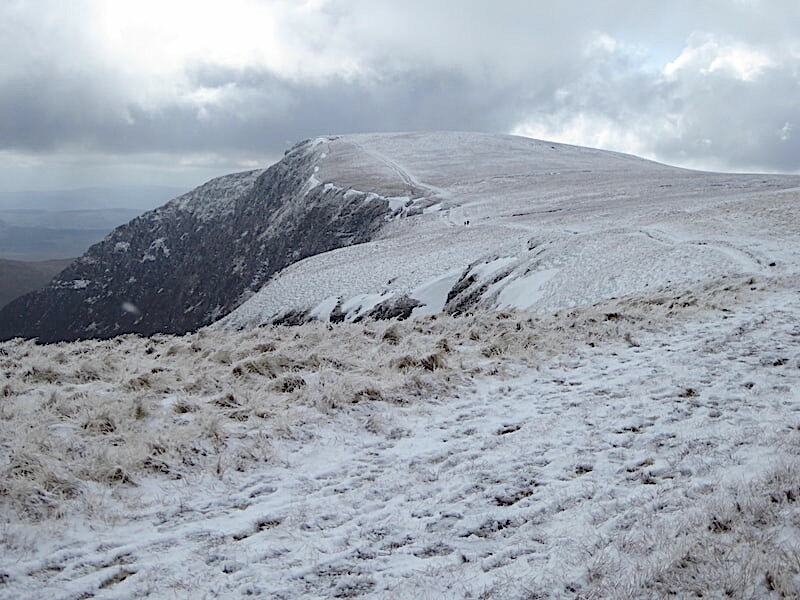 It might have provided seating for a coffee stop but as we approached two young walkers, male and female, stood up behind it, began studiously re-arranging their packs and avoiding any contact with us. They continued to do so during the short time we were there which we found odd since most folks manage a Hi or Hello at least. 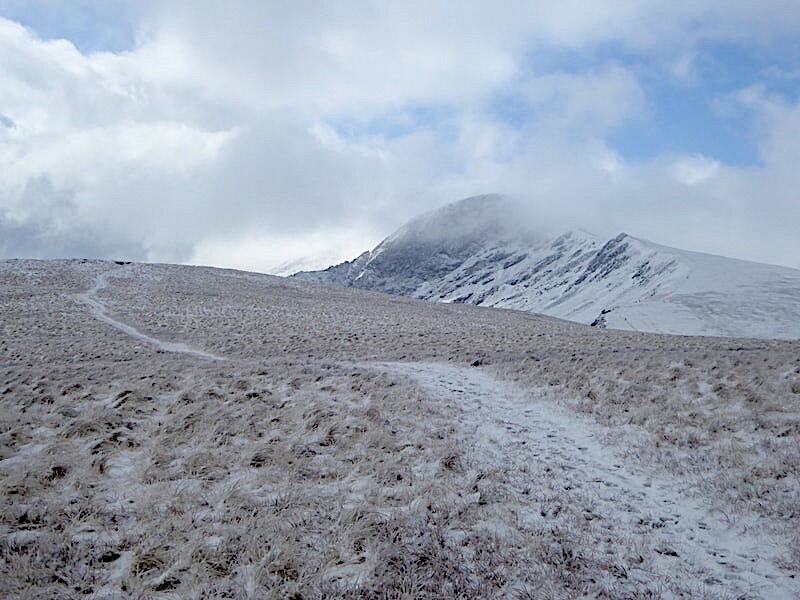 The cloud is down on Blencathra once more. 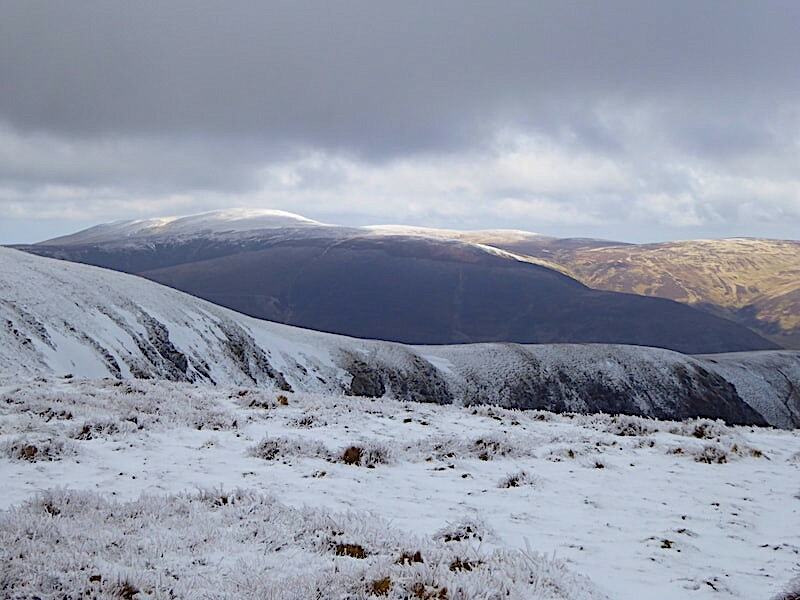 From the summit the view to the north west is of Knott and Great Sca Fell over on the right, with Bakestall just visible on the extreme left and Great Calva just to the right of it. 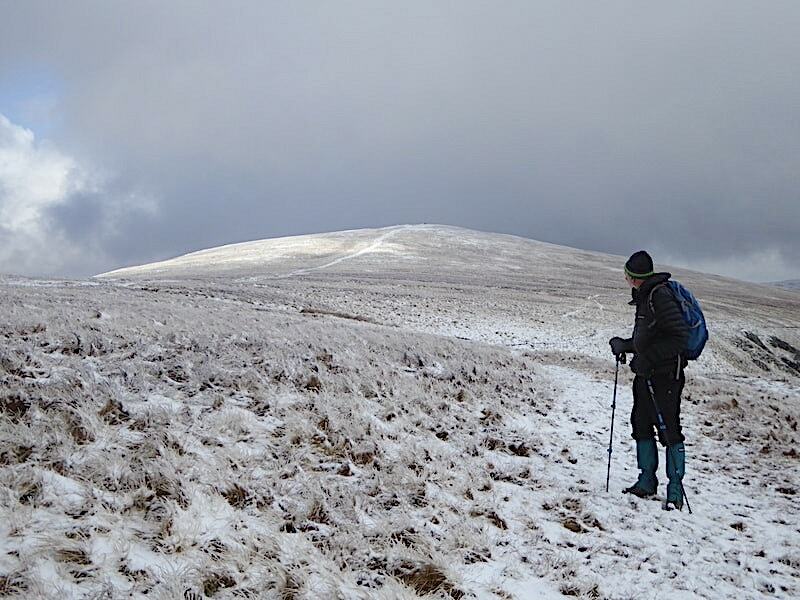 With the pair of walkers still busy re-arranging their packs behind us we abandon the idea of using the shelter for a coffee stop and begin the easy downhill tramp across Bannerdale Crags. The flattish section in the middle is an extensive area of marshy ground and pools so we plan to keep left and walk the path along the edge of the escarpment to avoid the marsh and enjoy the better views. Still no sunlight and the cloud has lowered again. A fine view of Bannerdale Crags as we drop down almost to the point where we need to head over to the path across the escarpment. 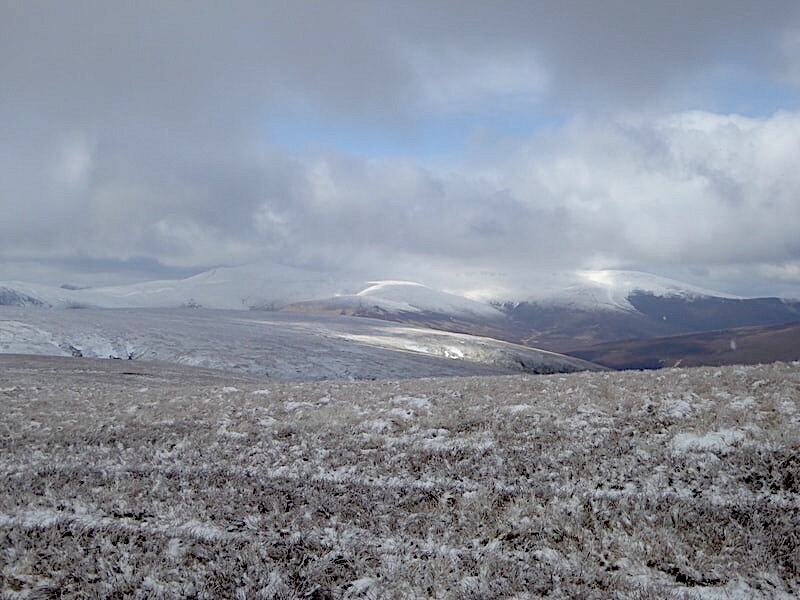 Surprisingly there seems to be a hint of sunshine across Threlkeld Common over on the left. Let’s hope it comes this way. 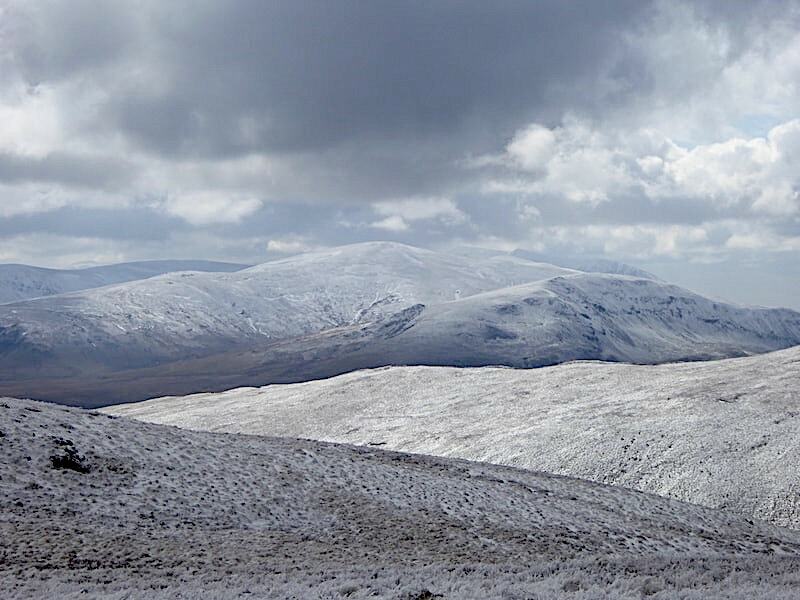 Over to our right and a couple of breaks in the cloud allow a few patches of sunlight to land on Mungrisedale Common, in the middle foreground, and some fells in the Skiddaw group, notably Sale How and Bakestall. 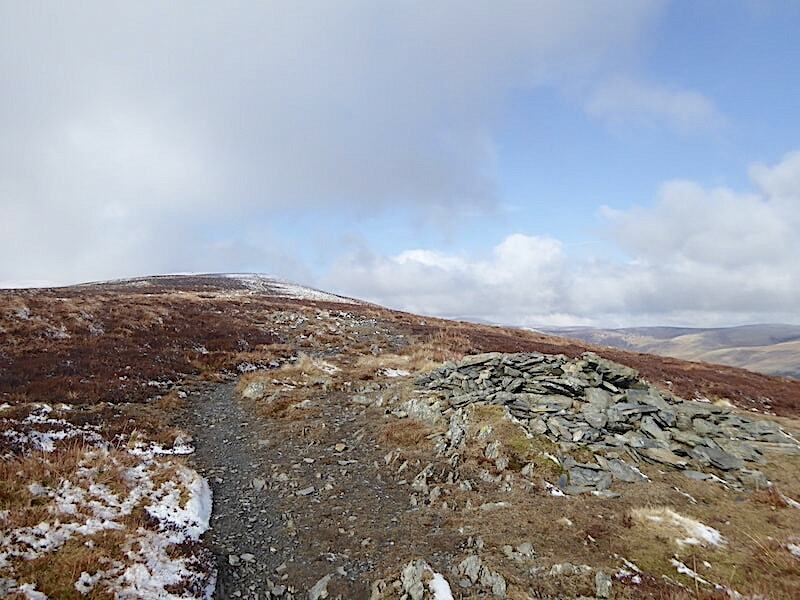 We cross over to the path along the escarpment and I take a look back at the summit shelter on Bowscale Fell, now without the pair of pack re-arrangers, who finally disappeared northwards about five minutes after we left the summit. 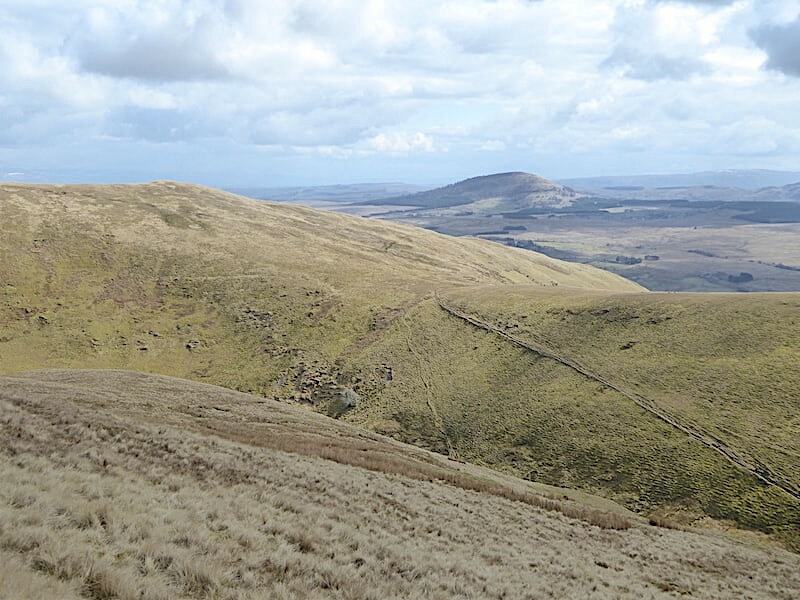 We reach the path across the escarpment with its view along Bannerdale towards Souther Fell, across the middle, with The Tongue over on the left and the east ridge of Bannerdale Crags over on the right. It looks much brighter over to the east, where we live so perhaps we should have stayed even closer to home today. 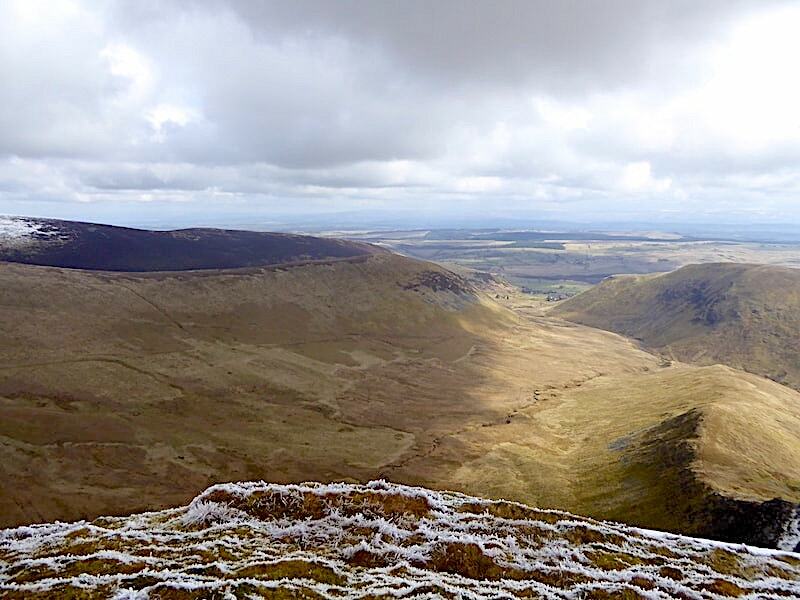 A daunting view from the escarpment of Bannerdale Crags and its east ridge. The path isn’t too close to the edge but the view definitely makes you want to take a few steps back from it because its a heck of a long way down. 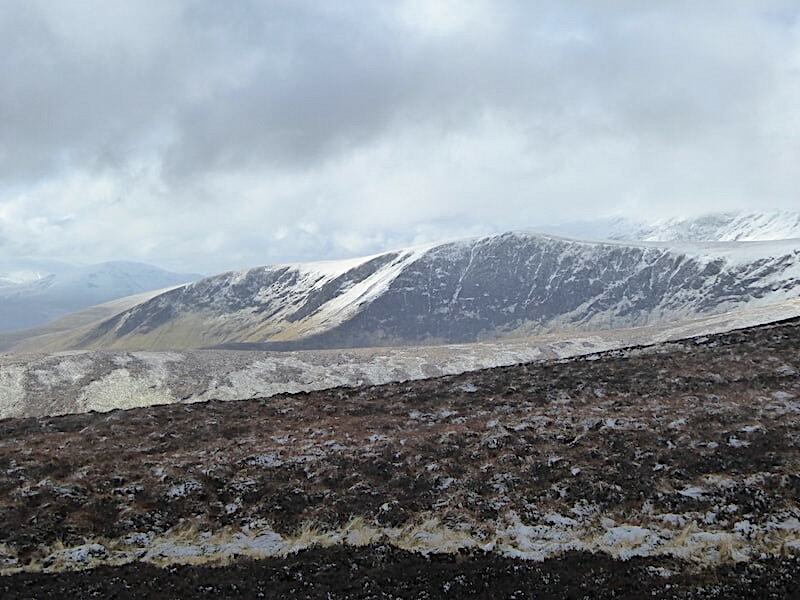 Another look back at Bowscale Fell summit which now has some sunshine, that’s fell walking weather contrariness for you. 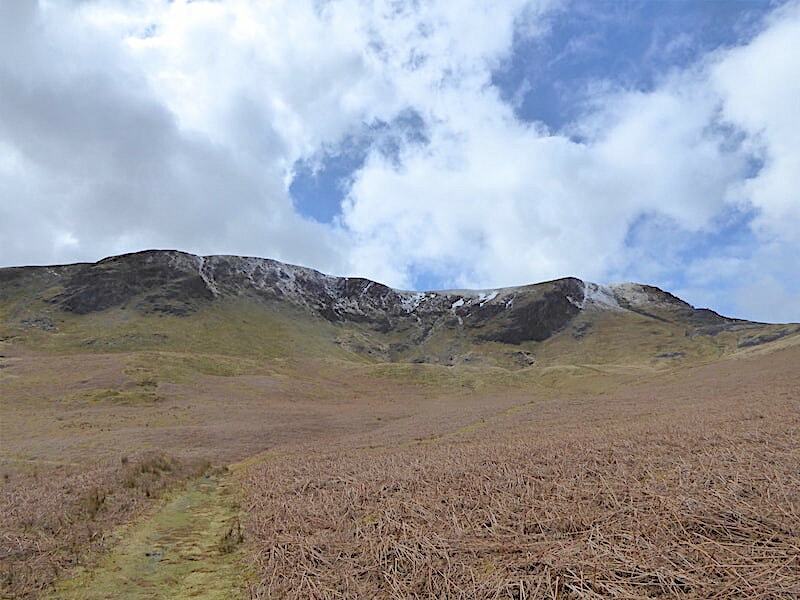 The summit of Bannerdale Crags rises up in front of us like a great hump backed whale and a little further along …..
….. we arrive at a path junction. 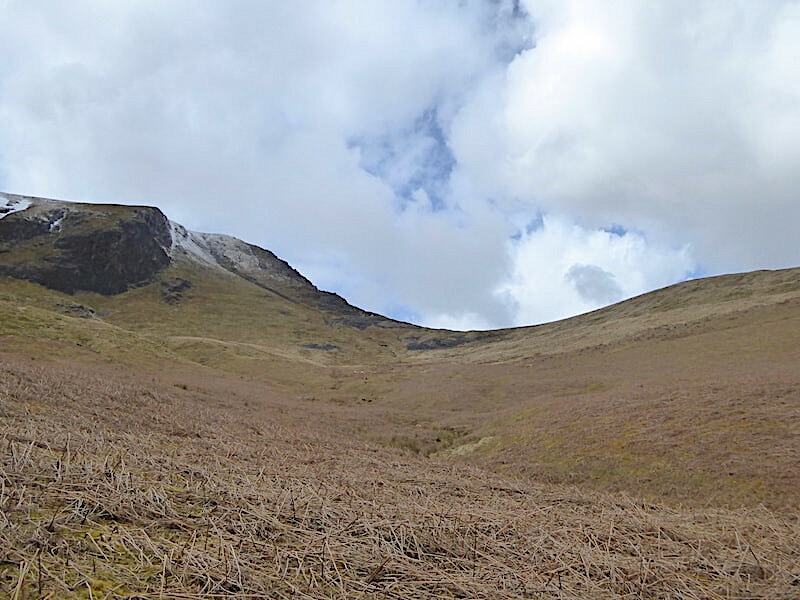 We take the left turn here but if you were heading for Blencathra and not Bannerdale Crags this would be one path which would lead you over to it. 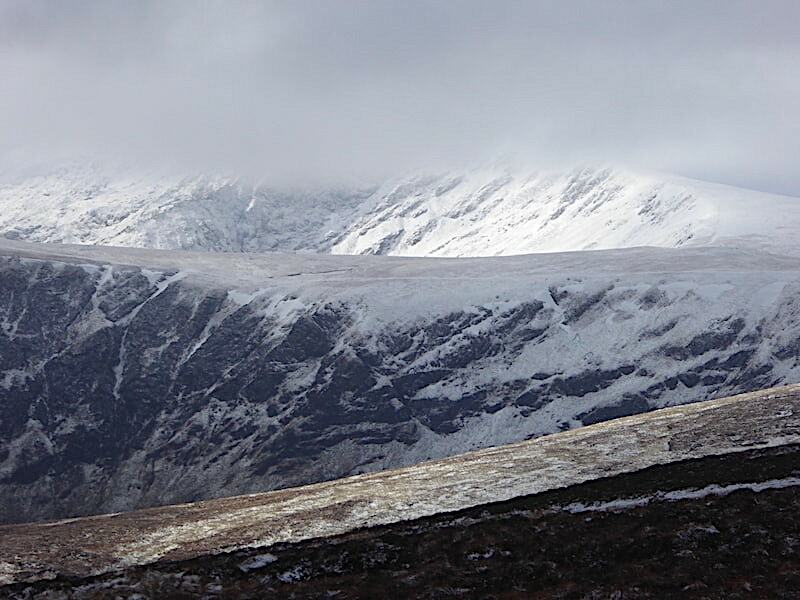 Some bluer skies and thinner cloud had arrived so …..
….. as Sharp Edge, on the left, was nicely silhouetted I thought it merited a closer look. Not having had a coffee break back up on Bowscale Fell we decided to have it here at the path junction. No handy rocks to perch on so it was a stand up affair with a few minutes of faffing about getting the flask and beakers out, one of us holding the beakers, while wearing chunky winter gloves, as the one being Mother, also wearing chunky winter gloves, poured the coffee. The first glug out of the flask missed the beaker and landed nicely on my gloves just as you could have predicted, fortunately the gloves are waterproof. Blame it on uneven ground, a sudden gust of wind, worries about the flask slipping through the gloves, whatever. We got there in the end and the warming drink was more than welcome. 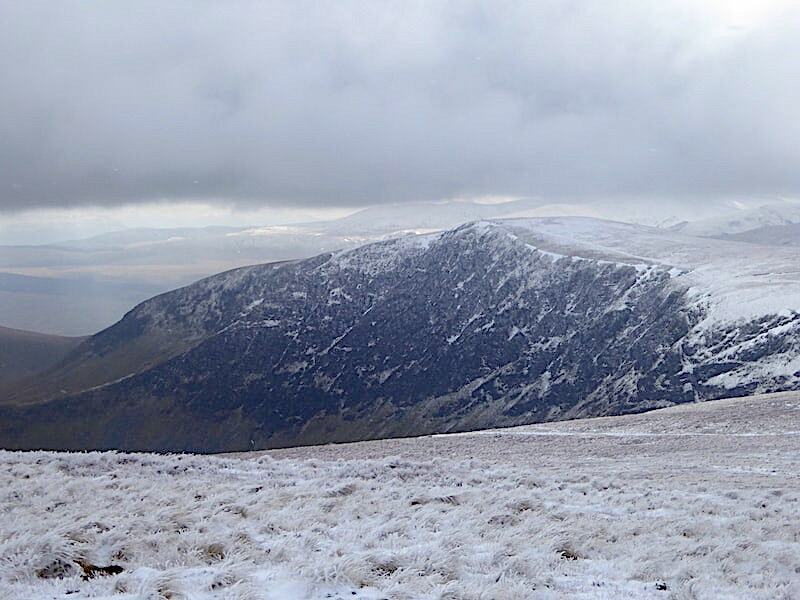 By the time we’d finished and put the things away the cloud had cleared off the top of Sharp Edge so I took the above close up shot just in case I didn’t get another opportunity. Back to the long view just to show that we did get a few seconds of sun and blue sky which never fails to lift the spirits no matter how brief the interlude. Suitably refreshed we head left and track over towards Bannerdale Crags summit and another splash of sunlight. Not busy with walkers but we did meet, or were followed up by, a couple of pairs and a few solo walkers. 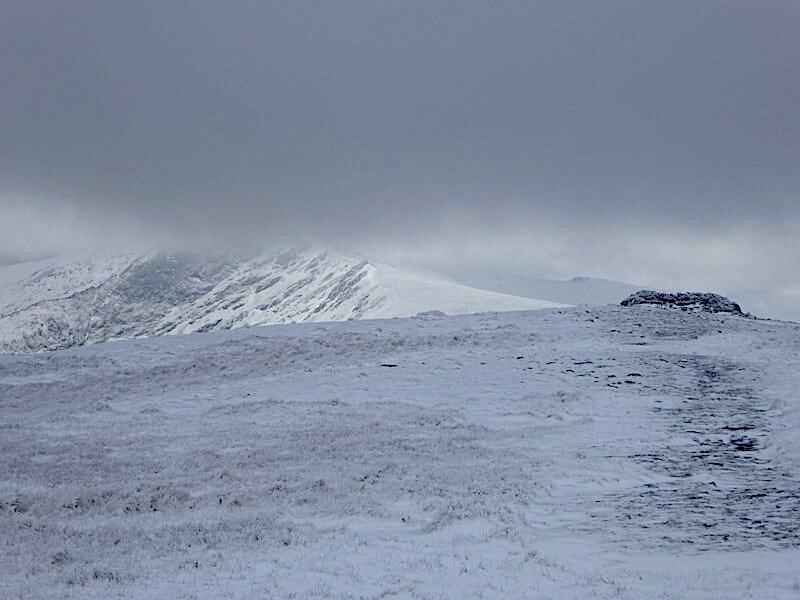 Another look down along Bannerdale as we climb over the higher sections of the crags …..
….. and at this point we definitely moved away from the established path up to much higher and safer ground. 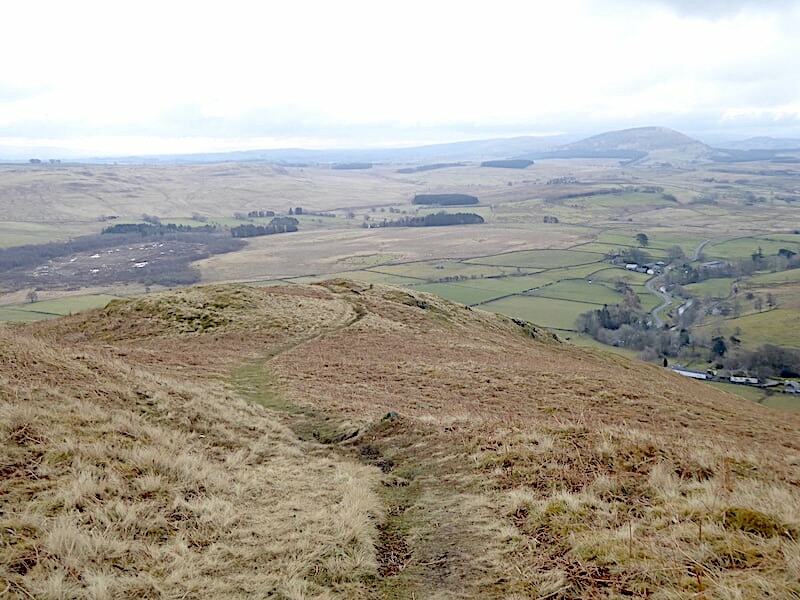 A look back over the escarpment to Bowscale Fell as we climbed onto the higher ground. The dark line at the bottom of the shot is the actual path but we avoided using it as it has become worn down into nothing more than a narrow groove which is awkward to walk in. We reach the viewpoint at the top of the crags and take in the view along a sunny Bannerdale and down the east ridge of the crags …..
….. and across to our left for the view back to Bowscale Fell with the dark top of Carrock Fell just peeping out the above the second false top …..
….. followed by another look down along the sunny valley bordered on the left by The Tongue, behind which is the very long and heathery east ridge of Bowscale Fell which we’d walked over earlier. 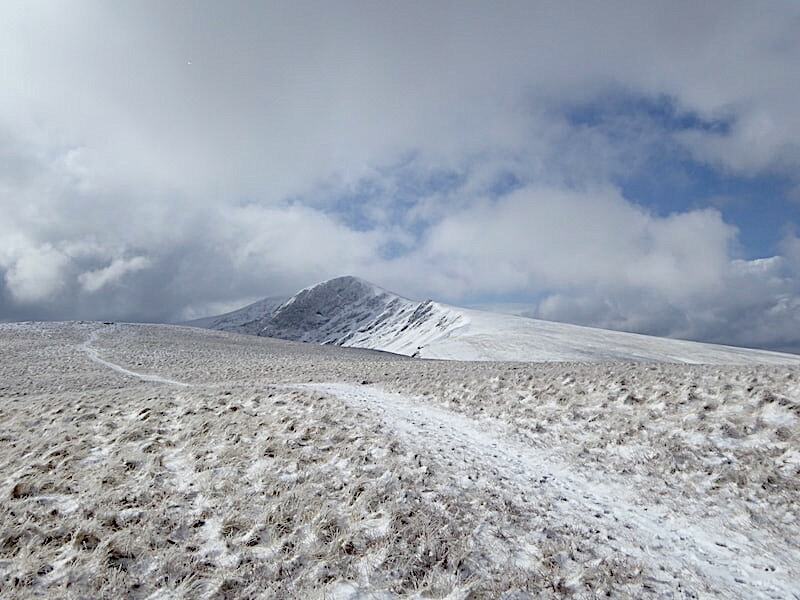 Immediately behind us was this marvellously sunny view of Blencathra, complete with blue sky and fluffy white cloud. We aren’t quite on the summit of Bannerdale Crags yet as there is more slightly rising ground behind us so we walk the few yards …..
….. up to the minimalist summit cairn, complete with a wooden stick poking out of it today, from where the view of Blencathra is rather less sunny than it was only a minute or so ago, but its still an imposing and impressive sight. 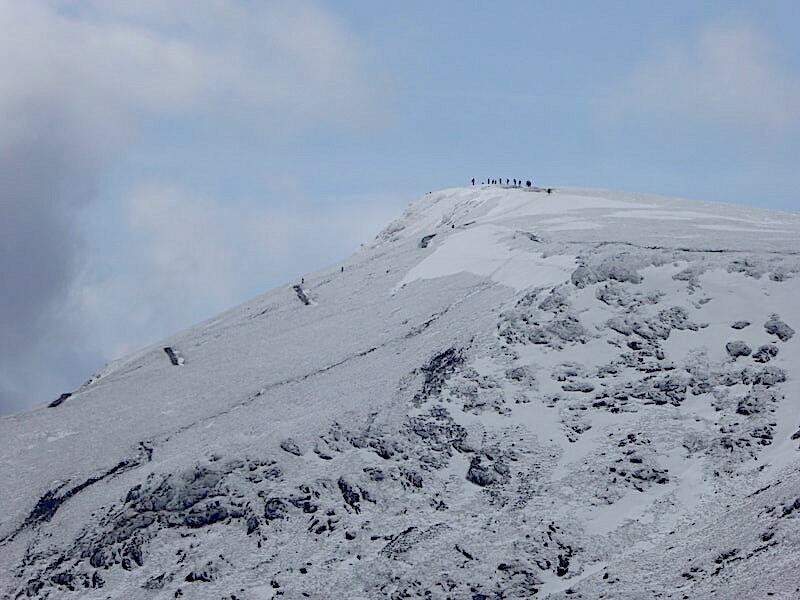 Zooming in on the summit of Blencathra to be able to answer the question, “Is there anyone up there today?” A bit of a gathering as usual, with another three, probably quite weary by this stage, toiling up the last few feet to the top on the Scales Fell route. 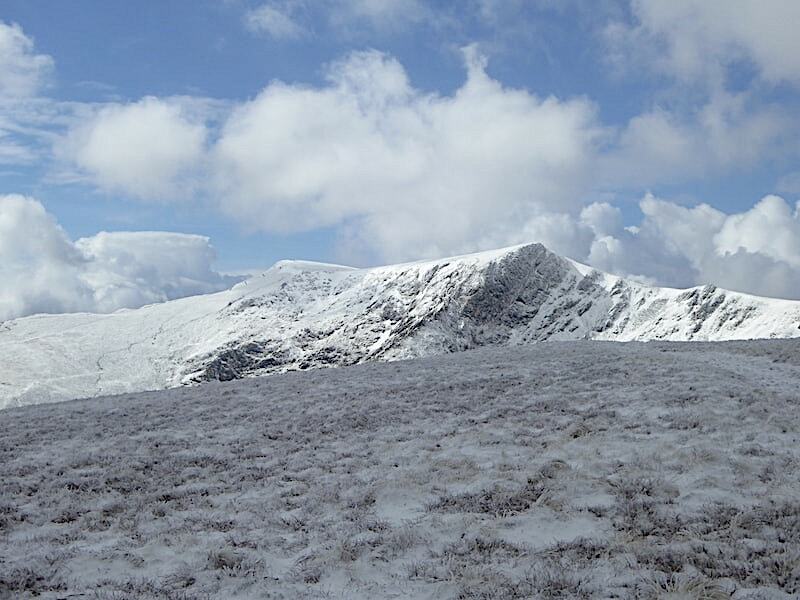 Beyond the sunny ridge of Scales Fell in the foreground is Clough Head with a very snowy Great Dodd right behind it. 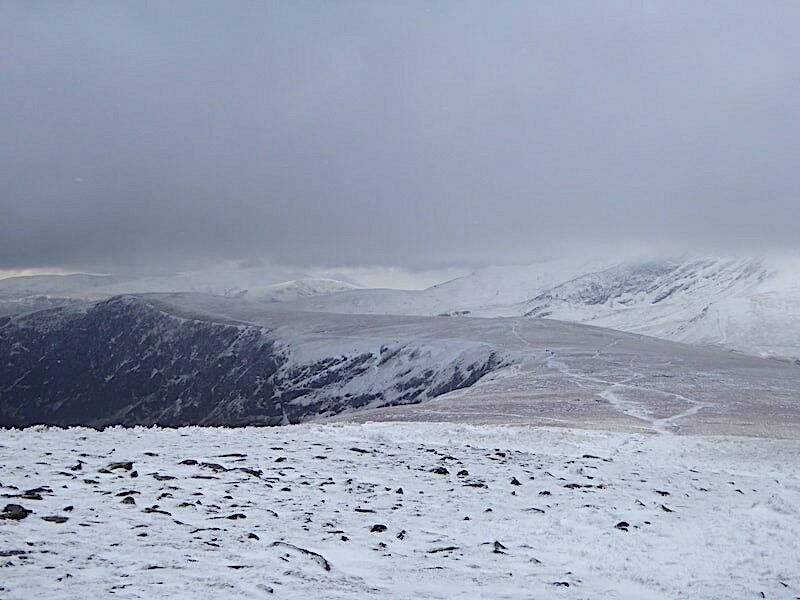 To the right of Great Dodd the shaded tops of the Helvellyn range are just visible below the cloud layer. 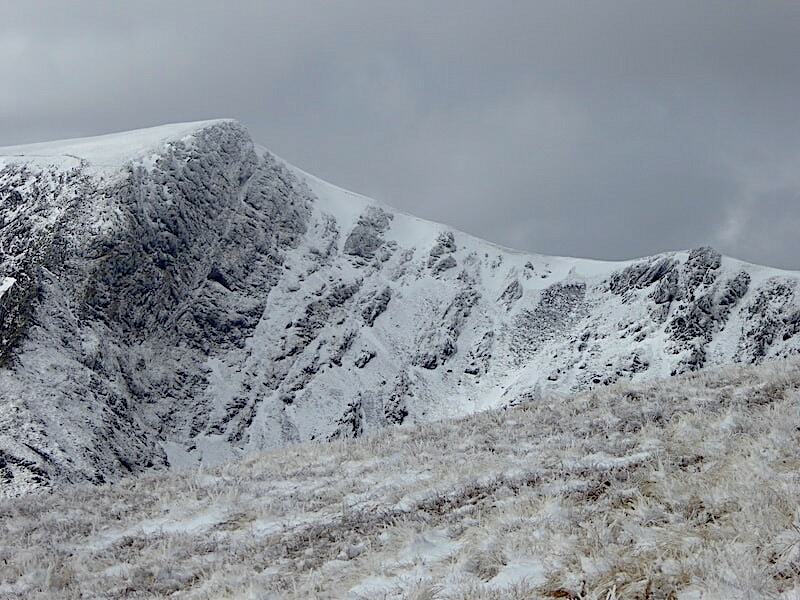 Helvellyn would certainly be busy today so let’s hope that everyone climbed and descended it safely. 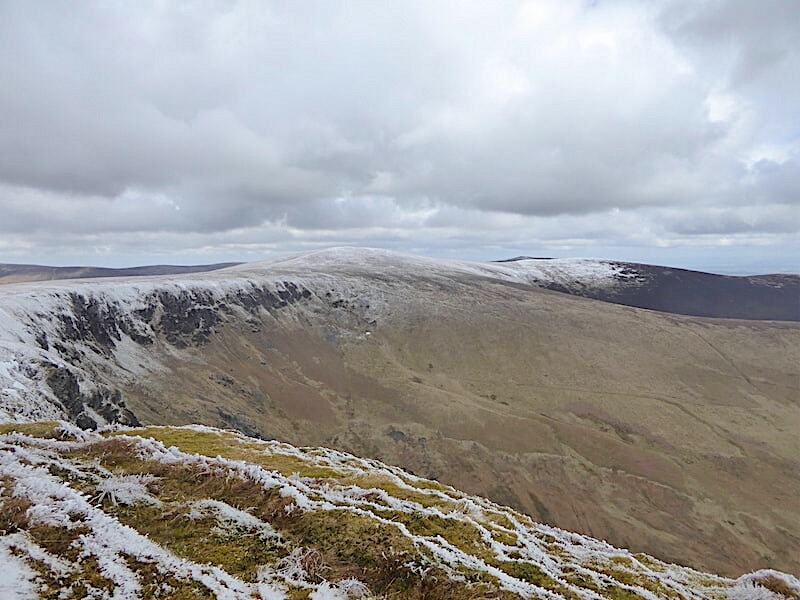 Having taken in the views we make our way off Bannerdale Crags and head south eastwards across the heather towards White Horse Bent …..
….. following the well trodden path all the way down. 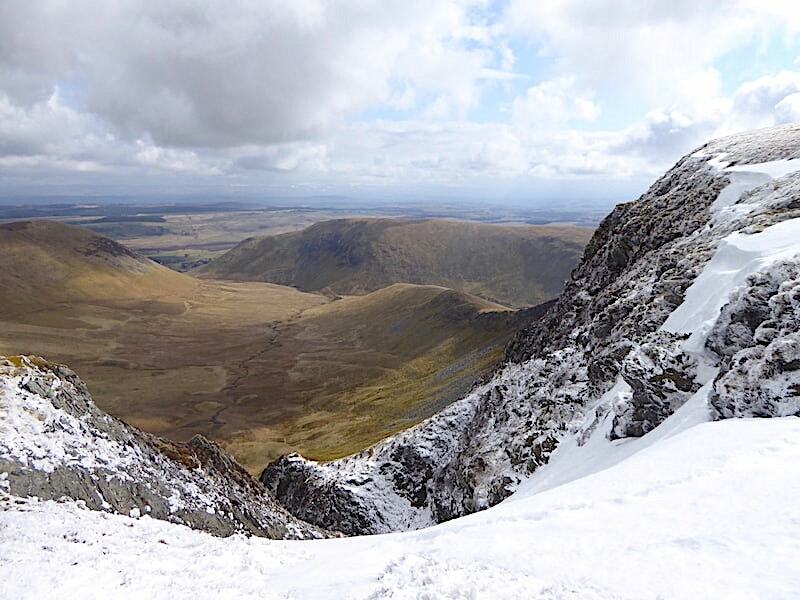 A look back at Sharp Edge, on the left, where if you look closely you might just be able to pick out two tiny figures silhouetted against the snow to the left of the climb out path. 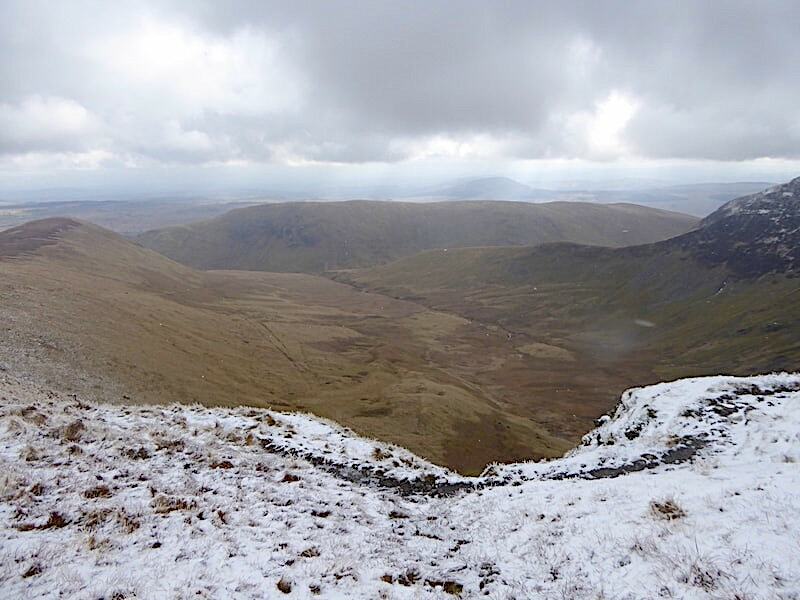 It must have been an icy walk across Sharp Edge today and its a route which will never appear on this site as neither of us can deal with that level of exposure. Before we start down White Horse Bent we walked over to this viewpoint above Blackthorn Beck for a look back at Blencathra. 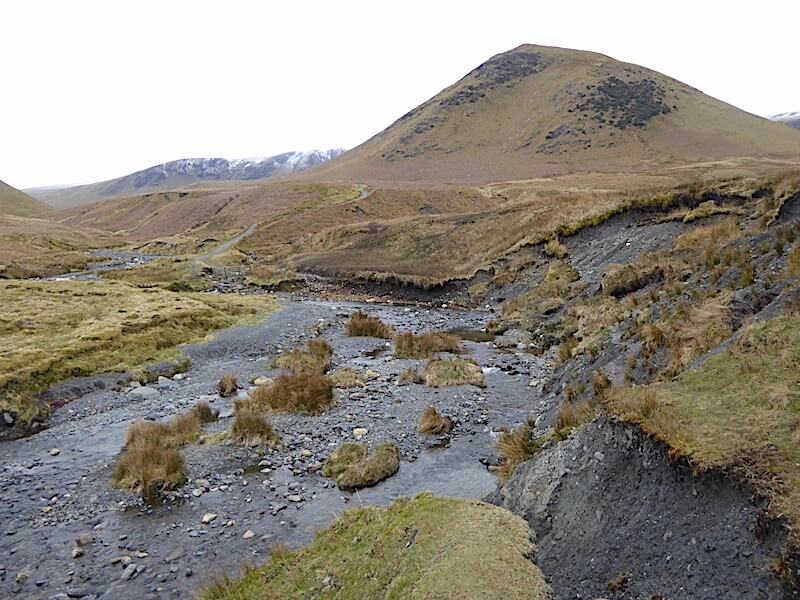 The path running along the side of Scales Fell goes all the way to the marshy little col between Blencathra and Bannerdale Crags. 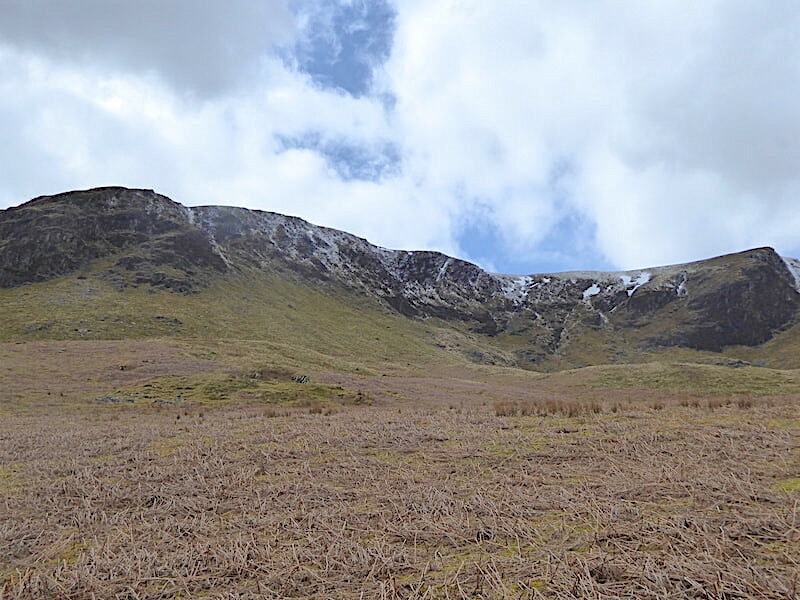 There is also a path going off to the left of it which goes up alongside Scales Beck, which is the groove down Scales Fell to the right of centre, this leads up to Scales Tarn from where another steep path joins the Scales Fell ridge path leading up to Blencathra’s summit. 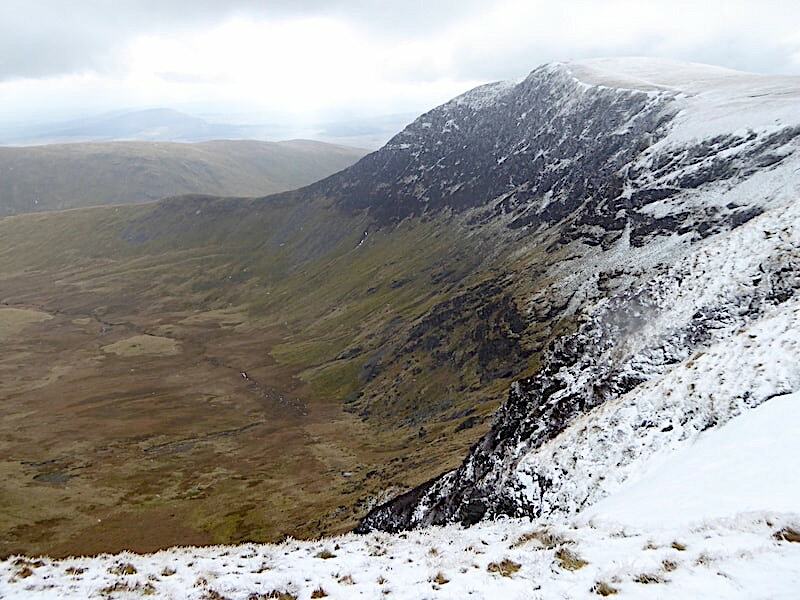 A closer look at the steep corrie walls surrounding Scales Tarn, although the tarn itself is not visible in this shot. 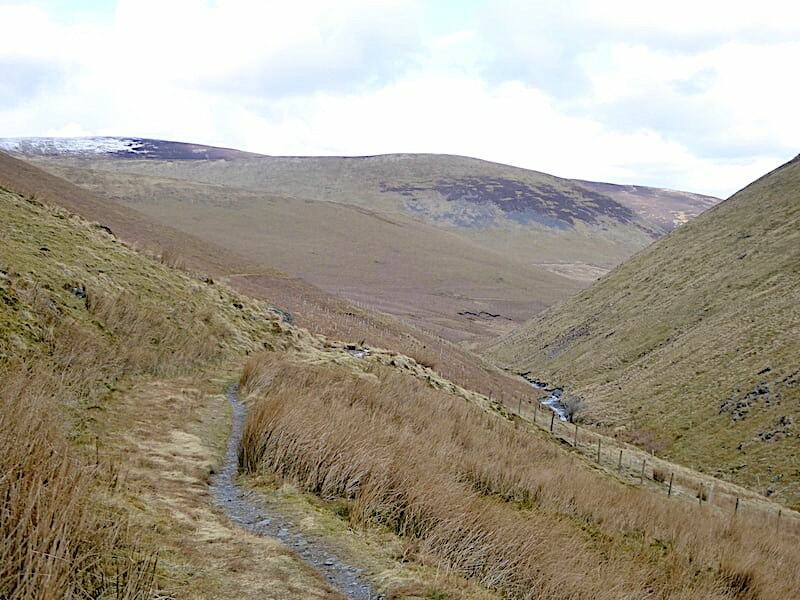 The path out of the corrie up to Scales Fell is clearly visible to the left, as is the zig-zag route just above it leading to the summit. 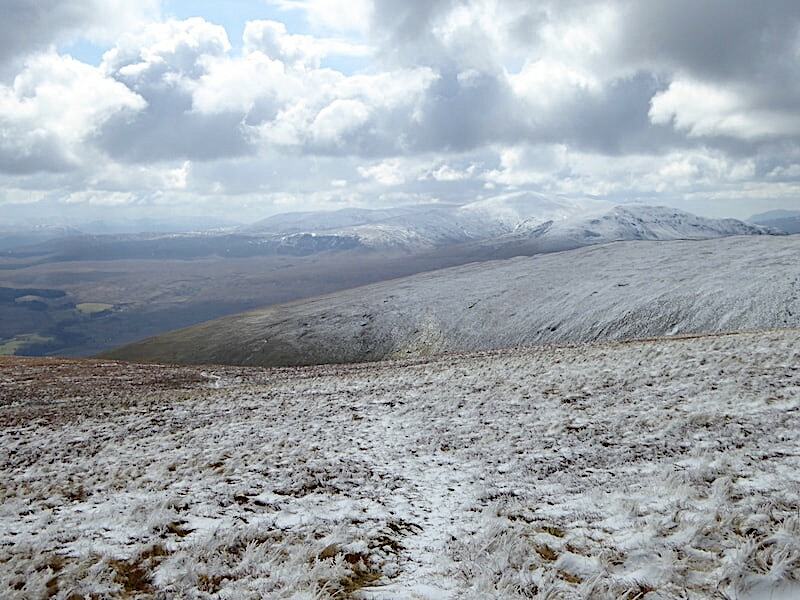 Nothing much to see beyond Great Dodd to the south east now that the cloud has come down again. 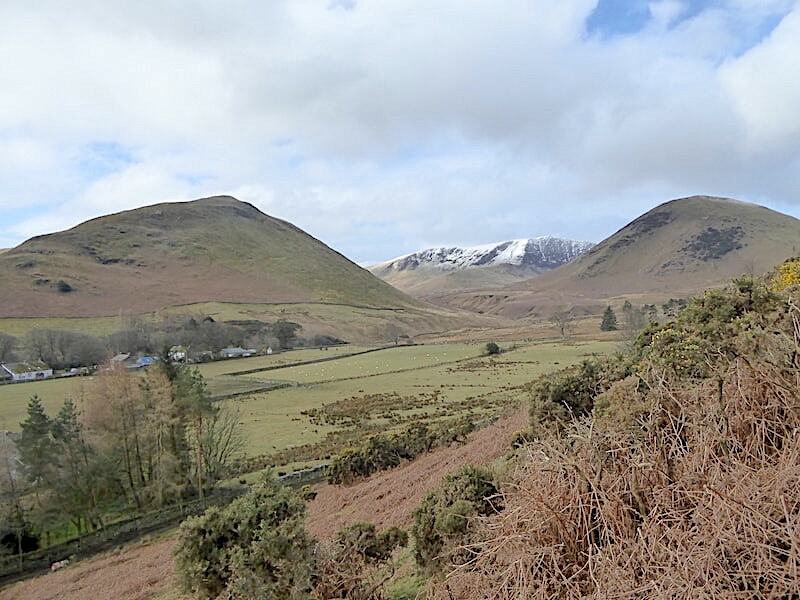 As I stopped to take this shot of Great Mell Fell and Gowbarrow across Threlkeld Common this little group stopped and asked where we were heading for. The ladies in the group looked somewhat relieved, one of whom stated, ‘Oh good, so you’ll know the way back then’ when we told them we were heading back to Mungrisedale. Was that an oblique reference to the route finding skills of some members of the group we wondered? The men in the party asked about the route down, one of them pointing to Souther Fell, the one with the sun on it, and asked if it was The Tongue. 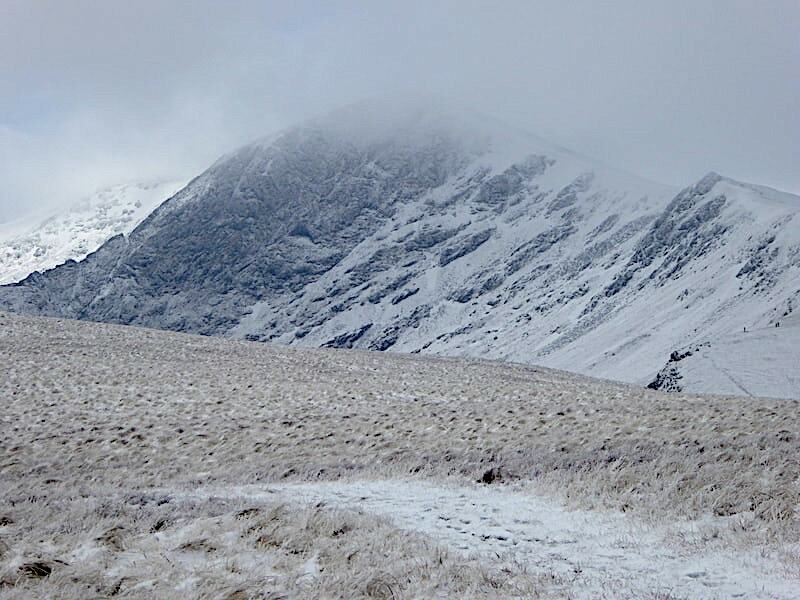 Were they heading for The Tongue we asked, no we’re heading for Mungrisedale was the reply. 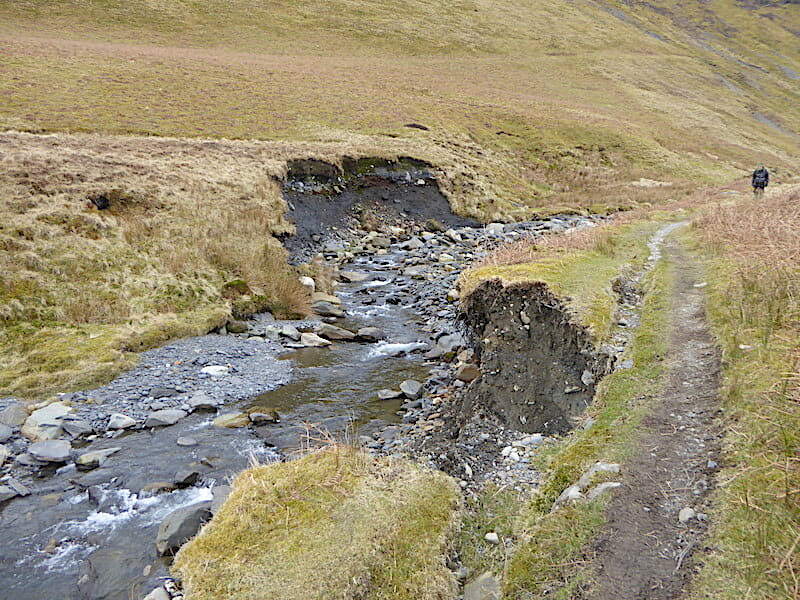 In that case, we replied, just follow the path down to the one alongside the River Glenderamackin, turn left and follow it all the way back to Mungrisedale, adding that quite a bit of it was very wet and that closer to the village the path had been completely washed away. With that off they went while I got on with taking the photo. 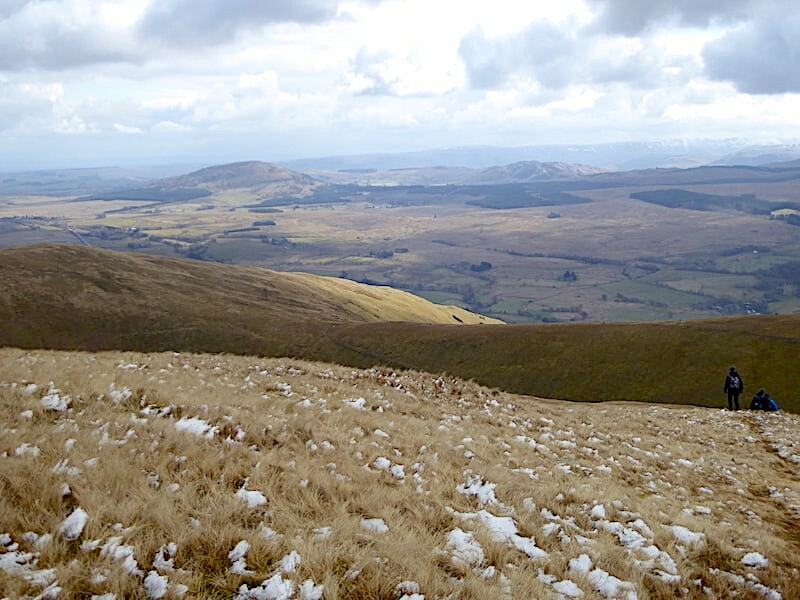 Further down White Horse Bent and Great Mell Fell lords it over the surrounding area, not that it has much competition since the only other eminence of any note nearby is Little Mell Fell, hidden by Souther Fell at this point. The walking group have just disappeared down the slope below us but we kept an eye on them to make sure they made their way down safely to the riverside path. We and the walking group made it back down to the path above the beck where we decided to stop and have something to eat. 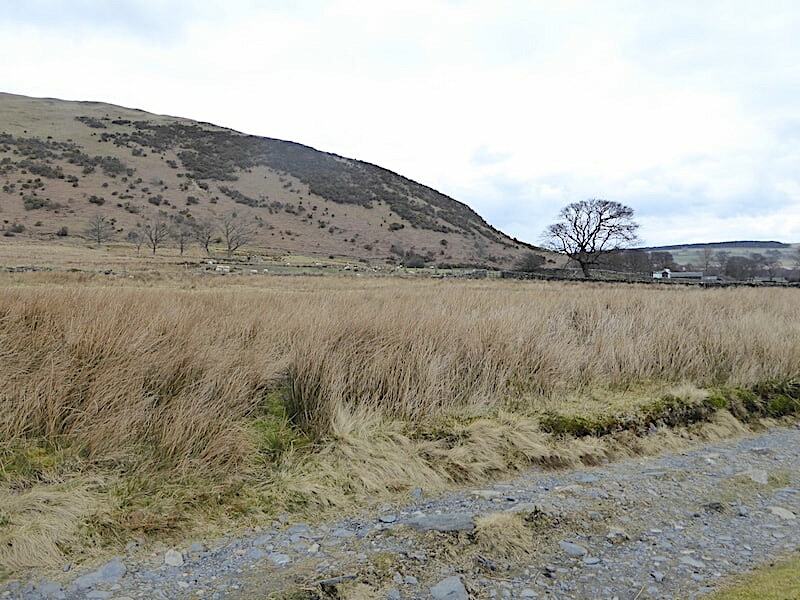 The men in the walking group started to head down the path but hearing us talking about stopping to eat the ladies in the group mentioned that they had brought some sandwiches whereupon the men turned around, sat themselves down and waited for lunch to come out of various packs and bags. Having seen much the same sort of thing before we just looked at each other and grinned. By the time we were packed up and ready to walk down the valley the walking group were well on their way and we didn’t catch sight of them again until we were almost back in Mungrisedale. 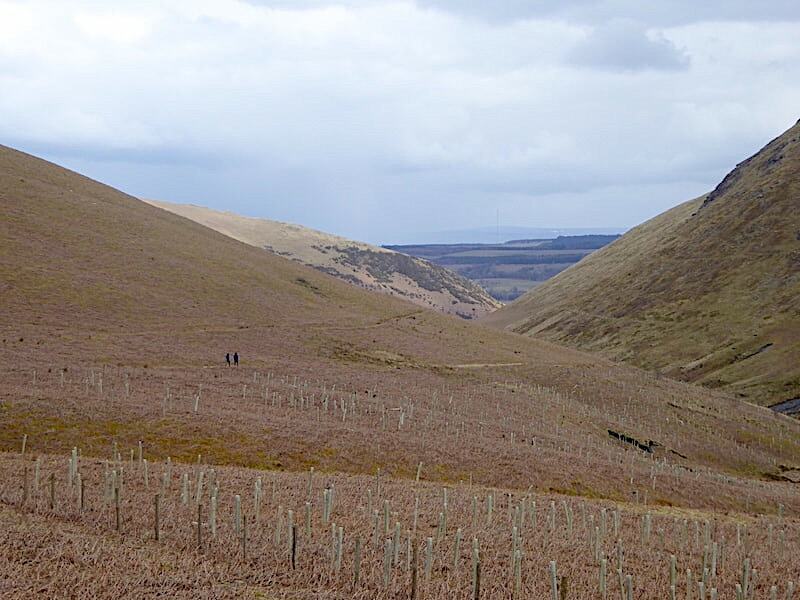 We’re much further down the valley now and gorse clad slopes of Raven Crags are back in view beyond the acres of dead brown bracken. 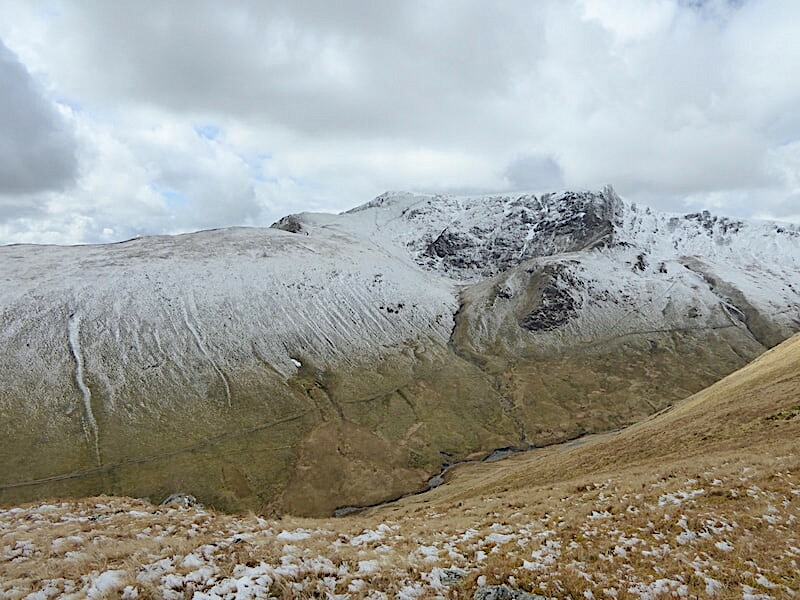 The route passes directly below the imposing sight of Bannerdale Crags …..
….. and its steep and craggy east ridge. 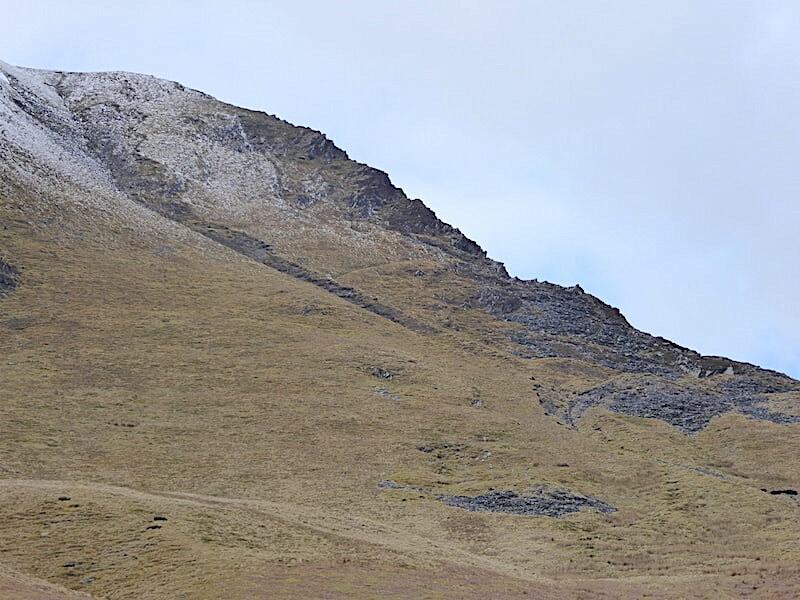 A closer look at the east ridge which does have a path going up it giving walkers the chance to have a look around the old mine workings up there. 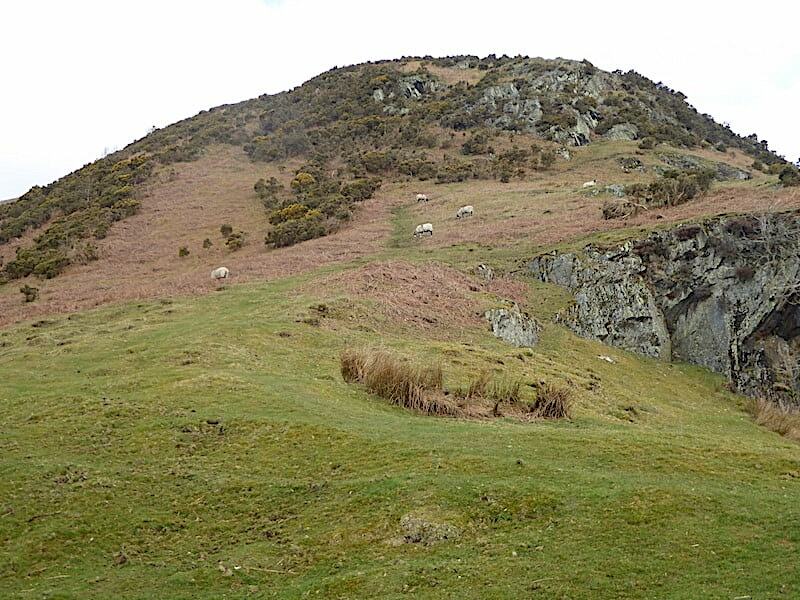 The path keeps to the side of the crags, but they can be climbed too if anyone has a mind to. 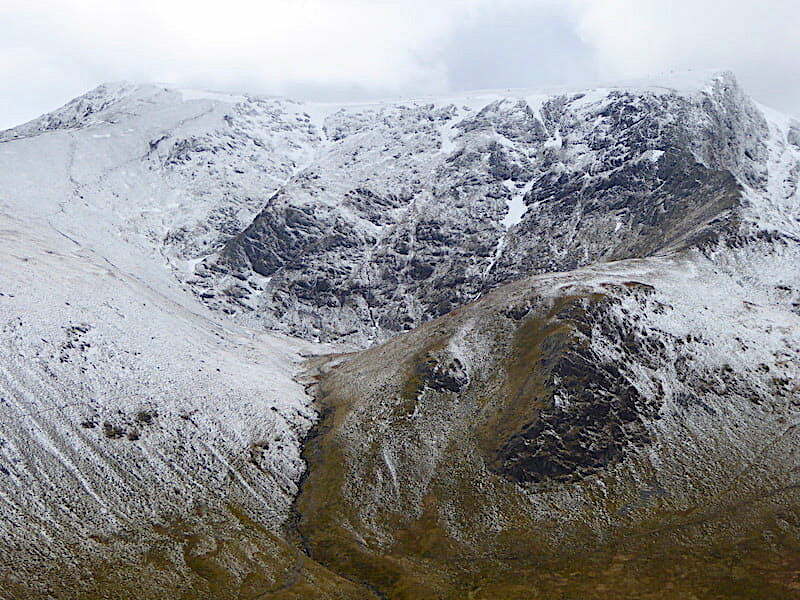 I took a couple more shots of the crags as we continued down the valley ….. 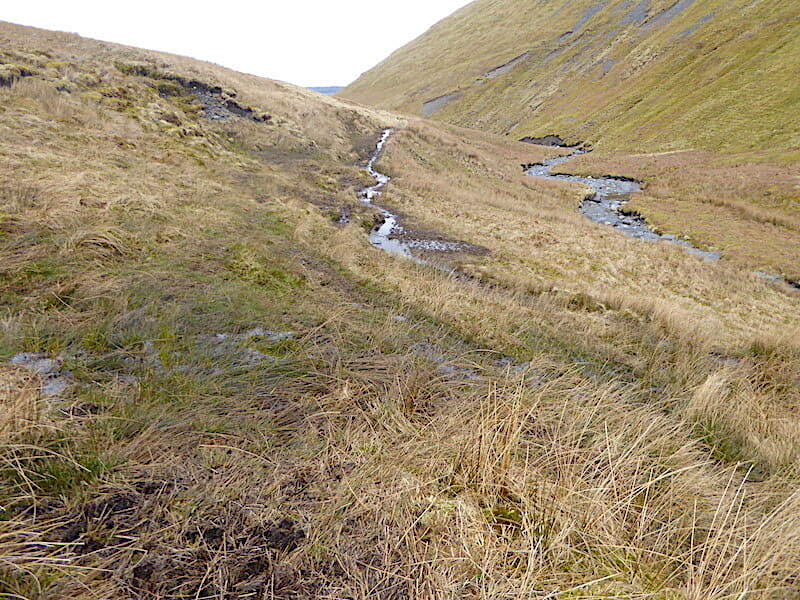 The path so far has been good but all that is about to change …..
….. the river is on the right, the watery line in the centre is the path and the ground on either side of it is either squelchy, muddy or both which gives rise to several minutes of unpleasant bog walking. At the bottom of the valley there is a great deal of flood damage and it won’t take much to wash away this section of the path either. There was a LDNPA notice further back up the path mentioning the path erosion and that consideration was being given to creating an alternative route. Time they got on with it then given that its well over two years since all this took place. This section of the path has gone completely, you used to be able to walk straight across here to the far section of the path just in front of the solo walker. The Park Authority have been considering the replacement path for so long that walkers have managed to create their own a little higher up the slope than the previous one. A little further along from the previous shot where things became rather more trying. 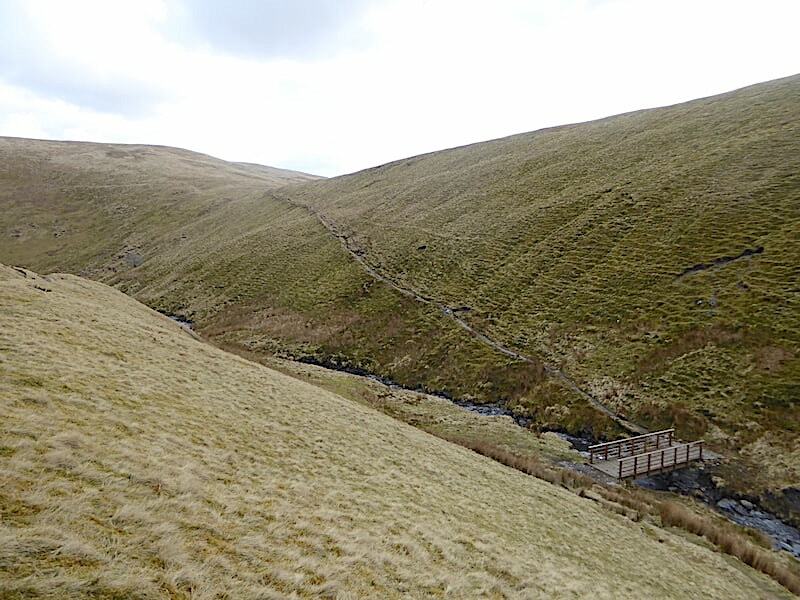 The path coming down the slope leads to the Bullfell Beck bridge which was dislodged during the storm and now stands precariously on not very much in particular. Once across the bridge the path used to come straight across to this point so now an alternative route must be found. You can either go across the very boggy ground rising directly opposite the bridge and make your way over the higher, and hopefully drier ground to pick up the path again. Our preferred option, as the water level was so low, was to walk across the dry stones close to the water’s edge and hop from one little island of gravel to the next when keeping to the water’s edge wasn’t a possibility. That got us across without any problems, but when the river is high then probably the only option would be the boggy morass opposite the bridge. Its high time this mess was sorted out, come on park authority, get a move on. No more difficulties after that and we had a firm dry track to follow back to Mungrisedale, with this view of Raven Crags on the other side of the valley. Between here and there the land is predominantly marshy as indicated by the preponderance of tough reedy grasses. 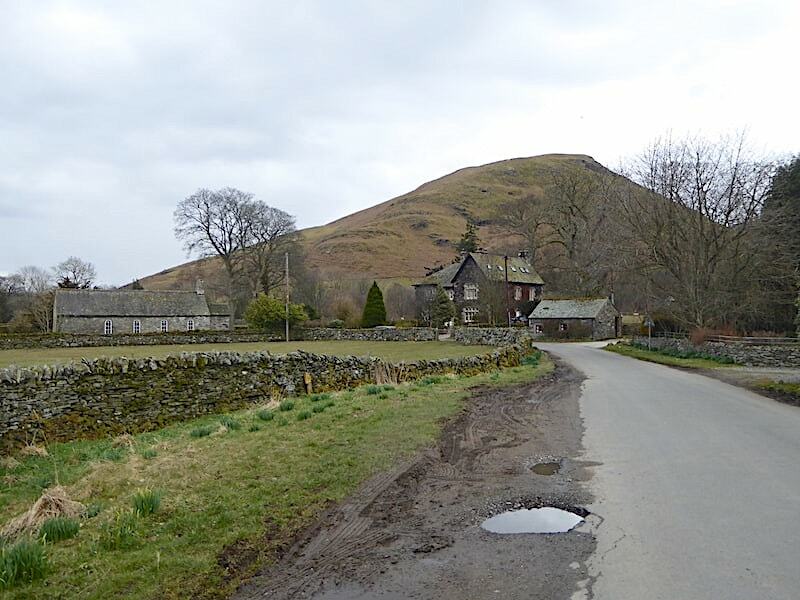 At the end of the track and a look back to The Tongue before …..
….. we carry on past Bannerdale View cottage and back on to the tarmac road …..
….. from where there’s just a short walk back to the roadside parking. 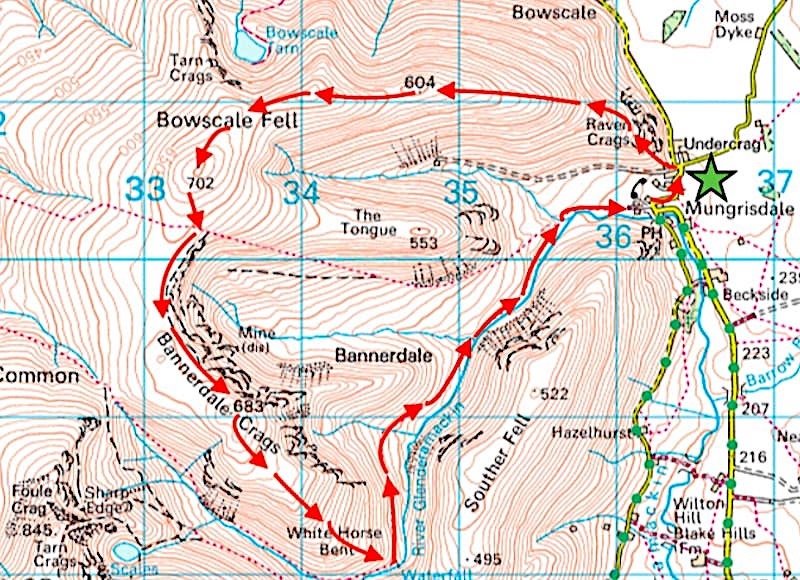 As we round the bend in the road our route up Raven Crags and across Bowscale Fell’s east ridge can be seen quite clearly …..
….. with a longer view showing more or less the full length of the east ridge. 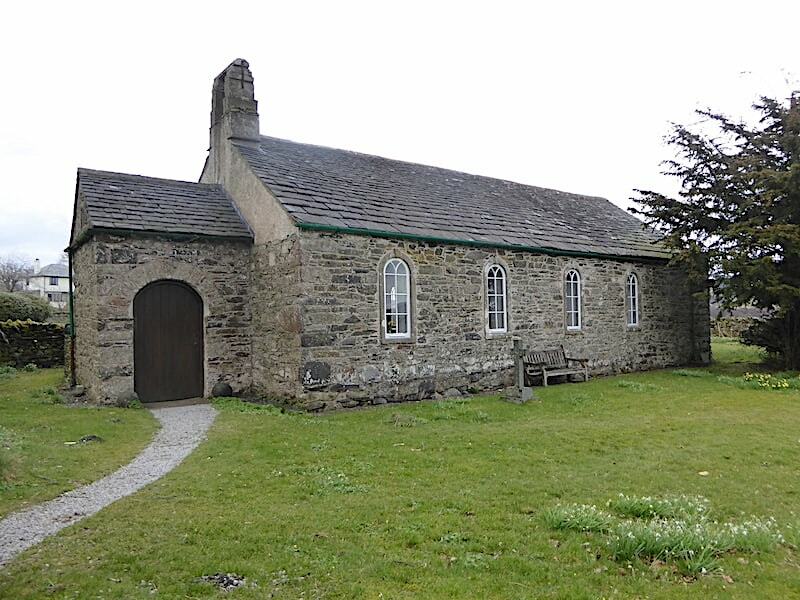 Mungrisedale’s compact and pretty little church of St Kentigern which has been standing here since 1756, although there have been several buildings on this site prior to that date. 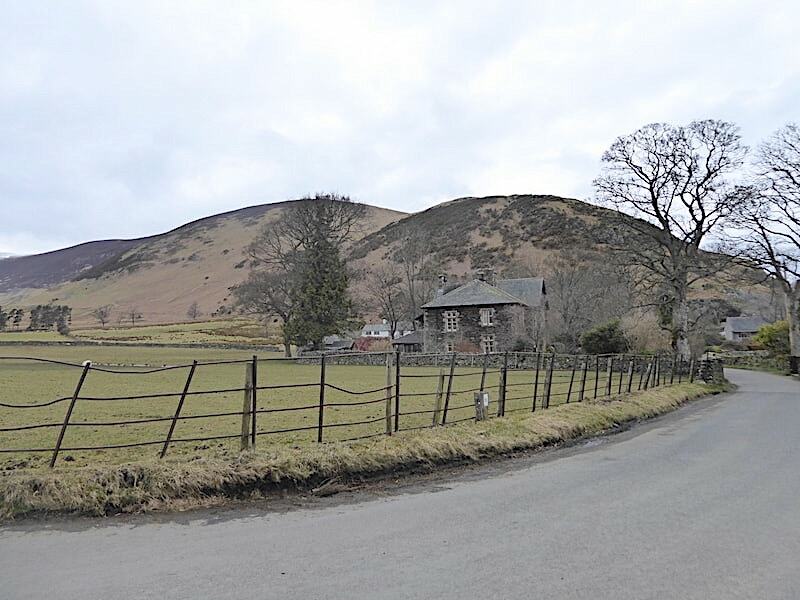 Back at the roadside parking area and we come to the end of today’s walk with a look back at Souther Fell rising above Mungrisedale village. What smattering of morning sun there was has now gone and the cloud cover is more or less total. The roadside daffodils are showing plenty of yellow buds but even they are still reluctant to brave the chilly weather and provide us with a bit of cheerful colour. An indication of how keen we are for some sign that it is actually spring was when we started examining the shrubs and trees in the gardens in the hope of seeing some tiny green leaf buds on the verge of bursting forth. Did we find any? Well, a forsythia was beginning to make the effort but only just, and as for everything else, nada. All in all it wasn’t too bad a day but I think we are getting a little tired of the snow and the chilly weather, not to mention being permanently swathed in layers of winter gear. Warmer and, hopefully, sunnier weather can’t come soon enough for me but, in the meantime, shall we get off home and get the kettle on? Aye, why not.